PRC 70? RESOLVED on the MOTION of Councillor John Thain seconded Councillor Jim Aitken OAM that apologies be received for Councillors Tricia Hitchen, Bernard Bratusa and Prue Car. PRC 71? RESOLVED on the MOTION of Councillor John Thain seconded Councillor Jim Aitken OAM that Leave of Absence be granted to Councillor Kevin Crameri OAM for 11? November 2013. PRC 72? RESOLVED on the MOTION of Councillor Jim Aitken OAM seconded Councillor Karen McKeown that the minutes of the Policy Review Committee Meeting of 14 October 2013 be confirmed. 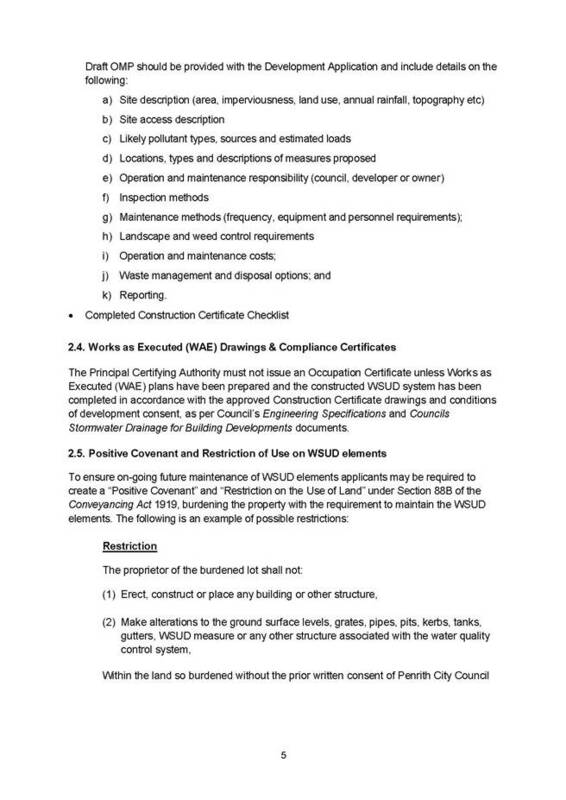 Councillor Jim Aitken OAM declared a Pecuniary Interest in Item 1 - Planning Proposal for Penrith Local Environmental Plan - Outcomes of Public Exhibition (Chapter B1 ? E4 Rural Lands, Castlereagh and Cranebrook) as he owns 3 properties in the area which are subject to the proposed zoning changes.
? Councillor Michelle Tormey in respect of 62 Joseph Street, Kingswood.
? Councillor Marcus Cornish in respect of 13/21 Haynes Street, Penrith.
? Councillor Jackie Greenow OAM in respect of 16,18 & 20 Pages Road, St Marys.
? Councillor Maurice Girotto in respect of 92 Victoria Street, Werrington.
? Councillor Karen McKeown in respect of Unit 3, 57 Regentville Road, Jamisontown.
? Councillor Mark Davies in respect of Unit 2/155-157 Derby Street, Penrith. The Strategic Planning Manager, Paul Grimson then? introduced? 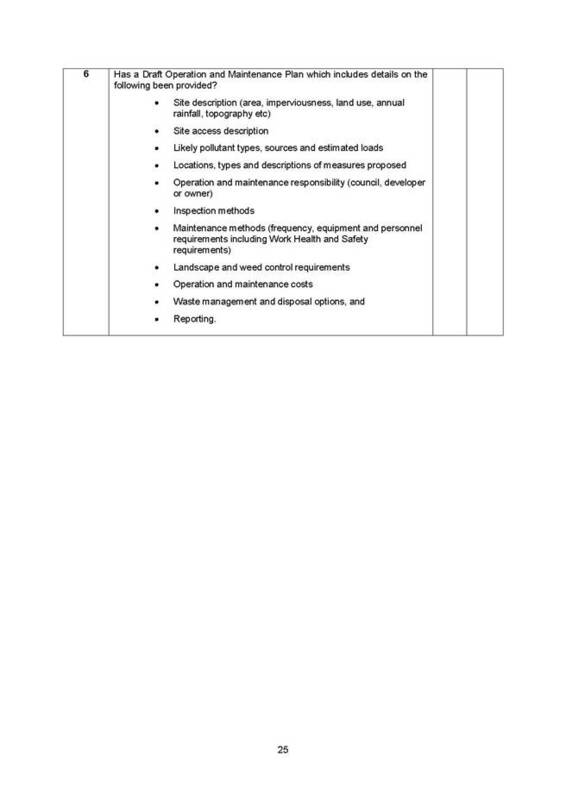 Item 1 - Planning Proposal for Penrith Local Environmental Plan ? Outcomes of Public Exhibition and gave a background of the work undertaken by the Council over a number of years and an overview of the substantial process which has been followed during this time. Ms Vella, an affected person, spoke in support of the recommendations.? Ms Vella represented herself and other residents of Hinxman Road who support the zoning of RU4 Primary Production Small Lots for the area.? Ms Vella detailed her history as an active member of the community, before outlining her concerns with the proposed application of the E4 Environmental Living zone to certain areas. PRC 73? RESOLVED on the MOTION of Councillor Marcus Cornish seconded Councillor Jim Aitken OAM that an extension of time be granted to enable the speaker to complete her address, the time being 7:18 pm. Ms Vella highlighted some of the land use conflicts already being experienced in the area and that agricultural land is being lost.? Ms Vella then concluded by stating that she supports the application of the RU4 Primary Production Small Lots zone for the Hinxman Road area and the E4 Environmental Living zone for the Castlecrest Estate. Ms Elias, an affected person, spoke in support of the recommendations,? 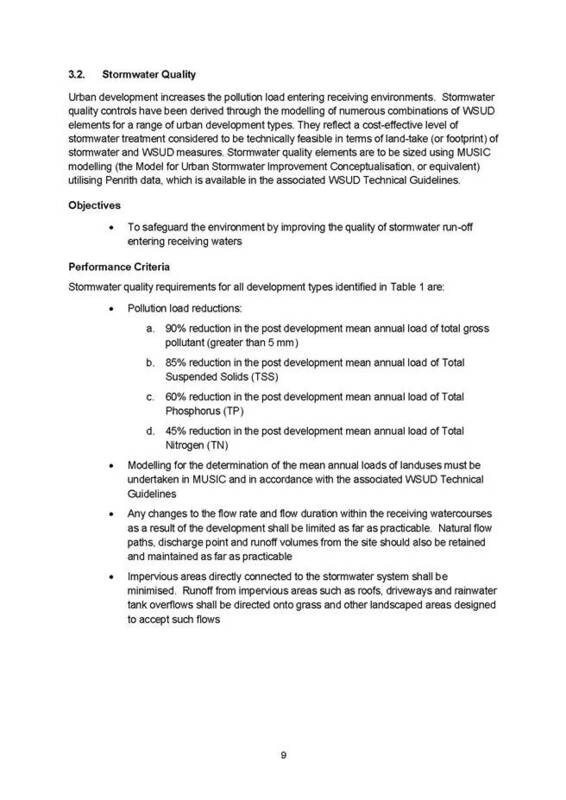 in particular the areas proposed to be zoned E4 Environmental Living.? Ms Elias highlighted that the land is not useful for farming because of the quality of soil. Ms Elias indicated that she believed that the majority of properties are family homes with rural usage is limited to the minority of properties in the area. Ms Elias stated that she believed the changes would have little impact on existing properties, allow for ecologically sustainable use of the land, and economically enhance the properties in the area. Ms Elias concluded by highlighting that existing government investment in infrastructure in Cranebrook Road would support the proposed E4 Environmental Living zone and that any potential development in the area would be supported by the area?s close proximity to the Penrith City Centre. PRC 74? RESOLVED on the MOTION of Councillor Greg Davies seconded Councillor Jim Aitken OAM that an extension of time be granted to enable the speaker to complete his address, the time being 7:31pm. Ms Martin, an affected person, spoke in opposition to the proposal to zone the western end of Hinxman Road as RU4 Primary Production Small Lots and wanted it to be zoned E4 Environmental Living.? Ms Martin outlined her concerns with impacts that agricultural uses were having on her property and in the local area.? PRC 75? RESOLVED on the MOTION of Councillor John Thain seconded Councillor Karen McKeown that an extension of time be granted to enable the speaker to complete her address, the time being 7:38pm. Mr Schweinsberg, an affected person, spoke in opposition to the recommendations.? Mr Schweinsberg welcomed the E4 Environmental Living zoning for the Castlecrest Estate, but stated that the proposed zoning of RU4 Primary Production Small Lots at the western end of West Hinxman Road was inconsistent.? Mr Schweinsberg raised concerns with the petitions that had been lodged with Council on this matter. PRC 76? RESOLVED on the MOTION of Councillor Mark Davies seconded Councillor Greg Davies that an extension of time be granted to enable the speaker to complete his address, the time being 7:48pm. In concluding, Mr Schweinsberg stated that he believed that there was a lack of notification of Council?s proposal for this area. Ms Kotja, an affected person, spoke in opposition to the recommendations and raised a number of specific questions regarding the planning proposal.? His Worship the Mayor, Councillor Ross Fowler OAM, advised Ms Kotja that the purpose of addressing the meeting was to advise Councillors of any issues she may have regarding the planning proposal.? Ms Kotja advised of her and the local resident?s concerns regarding social and traffic impacts from the Glossop Street proposal. Ms Robinson, representing Penrith Lakes Development Corporation, spoke in opposition to the recommendations and suggested that the Penrith Lakes Scheme should be deferred from the Council?s planning proposal and the existing local planning documents applying to the Penrith Lakes Scheme be retained. Mr Moran, an affected person, spoke in opposition to the recommendations and stated that the proposed zoning controls applying to his property were left out during the public exhibition process.? Mr Moran raised concerns that he is being prevented from constructing a dwelling on each of his seven lots because of flooding.? In concluding, Mr Moran suggested that Option C be considered by Council to allow him to lodge a development application. Mr Fragar, Town Planner for an affected owners, spoke in opposition to the recommendation.? Mr Fragar detailed that the exhibited planning proposal allowed for the development of three lots in Castlereagh (Discussion Paper Chapter C37).? Mr Fragar advised that after the public exhibition, Council?s staff advised that there was an error in the exhibited material and that additional dwellings were not? allowed on the lots.? Mr Fragar advised that his client was only provided two weeks to respond to this change in exhibited planning controls.? Mr Fragar highlighted that due process had failed. PRC 77? RESOLVED on the MOTION of Councillor Jim Aitken OAM seconded Councillor Maurice Girotto that an extension of time be granted to enable the speaker to complete his address, the time being 8:07pm. In conclusion, Mr Fragar suggested the alternative option of OC37(a) as opposed to the exhibited OC37(b).?? Mr Fragar described how the blocks can accommodate an effluent disposal system, relying on a geotechnical report, and that the area has the character of a rural village. Mr Stimson, Consultant for a landowner, Endeavour Holdings, spoke in opposition to the recommendation.? Mr Stimson advised that the property was a residue piece of land from the delivery of Dunheved Road.? Mr Stimson then advised of a proposed new business venture for the site that the Council officers may not have been aware of at the time of writing the report for this site.? Mr Stimson stated that this new business for the area would not affect other retail centres and that it would provide benefits to users of the existing retail centre.? In concluding, Mr Stimson proposed that the zoning of the site should be in accordance with option OC39(d), namely a B2 Local Centre zone. Mr Hardy, an owner?s Planning Consultant for the Werrington Signals Site, spoke in opposition to the recommendation.? In concluding, Mr Hardy requested that the proposed zoning of E2 Environmental Conservation and that building heights be reviewed to reflect the recent development consent and existing developments in the WELL Precinct.? Mr Hardy also requested a review of the suite of? business zones for the land to which the proposed B7 Business Park zone applies. 78? RESOLVED on the MOTION of Councillor Mark Davies seconded Councillor John Thain that the meeting adjourn until 8:45pm to enable discussion of the matters before the Council. PRC 79? 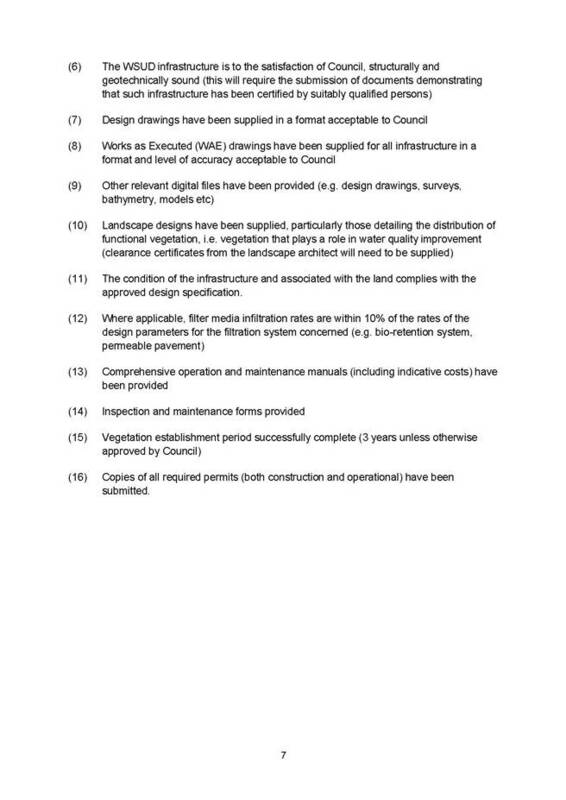 RESOLVED on the MOTION of Councillor Jackie Greenow OAM seconded Councillor Greg Davies that the recommendations relating to Chapters A1-A4 as detailed in Attachment 5 be endorsed. Councillor Jim Aitken OAM declared a Pecuniary Interest in Chapter B1 ? E4 Rural Lands, Castlereagh and Cranebrook as he owns 3 properties in the area which are subject to the proposed zoning changes. Councillor Jim Aitken OAM left the room for consideration of this matter, the time being 8:48pm. PRC 80? RESOLVED on the MOTION of Councillor John Thain seconded Councillor Marcus Cornish that the recommendation relating to Chapter B1 as detailed in Attachment 5 be endorsed. a. ???? Amend the zone boundaries of Glossop Street Precinct to limit the area to be zoned R4 High Density Residential to the west of Glossop Street and to the north of Chapel Street. b. ???? That the land to the east of Glossop Street and south of Chapel Street be zoned R3 Medium Density Residential with a maximum building height of 8.5 metres.? PRC 82? RESOLVED on the MOTION of Councillor Mark Davies seconded Councillor Greg Davies that the recommendations relating to Chapters B3,B4 & B5 as detailed in Attachment 5 be endorsed. PRC 83? RESOLVED on the MOTION of Councillor John Thain seconded Councillor Mark Davies that the recommendation relating to Chapter C37 as detailed in Attachment 5 be deferred until the next Ordinary Council meeting to allow for further examination and discussion. PRC 85? RESOLVED on the MOTION of Councillor John Thain seconded Councillor Marcus Cornish that the recommendation relating to Chapter C43 as detailed in Attachment 5 be deferred until the next Ordinary Council meeting to allow for further examination and discussion. PRC 86? RESOLVED on the MOTION of Councillor Greg Davies seconded Councillor Mark Davies that the recommendations relating to Chapters C1- C48 (Excluding Chapters C37, C39 and C43) as detailed in Attachment 5 be endorsed. PRC 87? RESOLVED on the MOTION of Councillor Karen McKeown seconded Councillor Ben Goldfinch that the recommendations relating to Chapters D1-D34 as detailed in Attachment 5 be endorsed. *1????? Planning Proposal for Penrith Local Environmental Plan - Outcomes of Public Exhibition????????????????????????????????????????????????????????????????????????????????????????????????????????????????????????????????????????????? 1.???? The information contained in the report on Planning Proposal for Penrith Local Environmental Plan - Outcomes of Public Exhibition be received. d.?? The recommendations of each Chapter in Attachment 5 (excluding Chapters B2, C37, C39 & C43). 3.???? The General Manager be granted delegation to make any necessary minor changes required to the Planning Proposal for Penrith Local Environmental Plan before submitting it to the Minister for Planning and Infrastructure. 4.???? Council endorse the Planning Proposal for Penrith Local Environmental Plan to be forwarded to the Minister for Planning and Infrastructure with a request that the Minister consider the changes made to the Planning Proposal in response to the public exhibition, and make a determination as to whether the Planning Proposal is to be re-exhibited in accordance with s58 of the Environmental Planning and Assessment Act 1979. 5.?????? The Minister be requested to make the plan in accordance with the Environmental Planning and Assessment Act 1979, should he determine that re-exhibition is not required. PRC 89? RESOLVED on the MOTION of Councillor Jim Aitken OAM seconded Councillor Jackie Greenow OAM that that the press and public be excluded from the meeting to deal with the following matter the time being 9:28pm. 2??????? Fernhill and Property Investor Article ??????????????????????????????????????????????????????????????????????????? 2??????? Fernhill and Property Investor Article???????????????????????????????????????????????????????????????????????????? PRC 91? RESOLVED on the MOTION of Councillor John Thain seconded Councillor Marcus Cornish that apologies be accepted from Councillors Bernard Bratusa and Michelle Tormey for their non-attendance at the meeting. Place Manager, Jeni Pollard introduced the report and invited Steve Perry, Chairperson of the St Marys Town Centre Limited to give a presentation.?????????????????????????????????????????????????????????????????????????????????????????? Children? Services Manager, Janet Keegan introduced the report and invited Max Friend, Chairperson of Penrith City Children?s Services Cooperative Ltd to give a presentation. 3.???? The Penrith City Children?s Services Cooperative Ltd undertake a survey on the effectiveness of the current tender for child care consumables, and provide a report on the outcomes of this survey to a future Policy Review Committee meeting. Executive Manager ? Environment and City Development, Wayne Mitchell introduced the report and spoke on behalf of Alan Brown, Chairman of Penrith Aquatic and Leisure Limited, who was unable to attend the meeting, and then invited Greg Crawford, General Manager of Ripples to give a presentation.??????????????? Councillor Mark Davies left the meeting, the time being 8:25pm.??????????????????????????????????????????????? Councillor Karen McKeown returned to the meeting, the time being 8:30pm.???????????????????????????? Planning Proposal for Penrith Local Environmental Plan??? Compiled by:?????????????? Abdul Cheema, City Planning Coordinator? Authorised by:??????????? Paul Grimson, Strategic Planning Manager ?? Over the past few years Council has been developing a single comprehensive Local Environmental Plan (LEP) for Penrith in two stages.? Stage 1 (Penrith LEP 2010) generally covers the rural areas, industrial areas, heritage items and the St Marys Town Centre.? Stage 1 of the LEP was made by the Minister for Planning on 22 September 2010.? Stage 2 (Planning Proposal for Penrith LEP) generally covers all residential areas and local retail/commercial centres except St Marys Release Area which incorporates Jordan Springs. At its Ordinary Meeting of 19 November 2012, Council endorsed the Planning Proposal for Penrith LEP to be submitted to the Department of Planning and Infrastructure for a revised Gateway Determination under Section 56 of the Act. 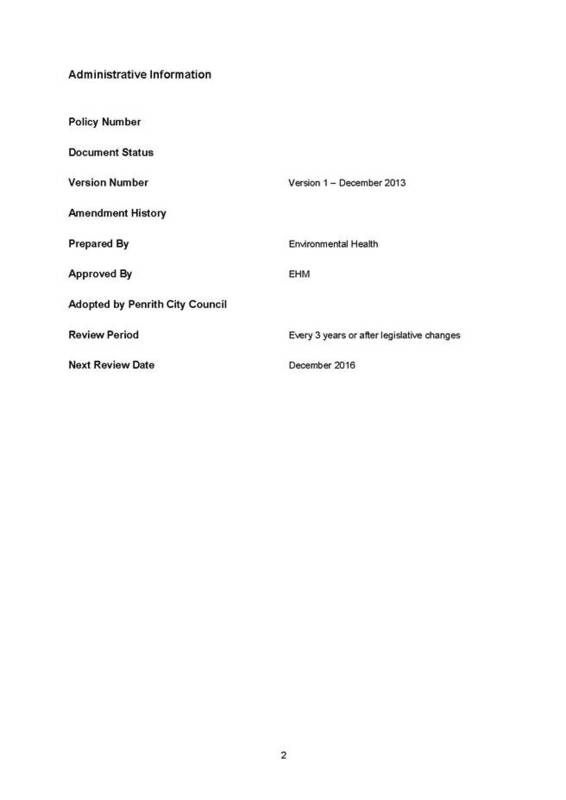 Council received a final Gateway Determination dated 23 April 2013 authorising Council to publicly exhibit the Planning Proposal for Penrith Local Environmental Plan. Subsequently, the Planning Proposal was exhibited from Monday 13 May to Friday 5 July 2013.? During this public exhibition period, a total of 4,630 enquiries were received resulting in a total of 819 submissions.? There were 766 submissions received from the community and 53 submissions received from 34 public authorities. Council has been undertaking a major planning exercise to prepare a new City-wide LEP.? The new City-wide LEP must comply with the Government?s LEP template. ?? Stage 1 generally covers the rural areas, industrial areas, St Marys Town Centre and heritage items.? Stage 1 of the Local Environmental Plan was made by the Minister for Planning on 22 September 2010. ?? 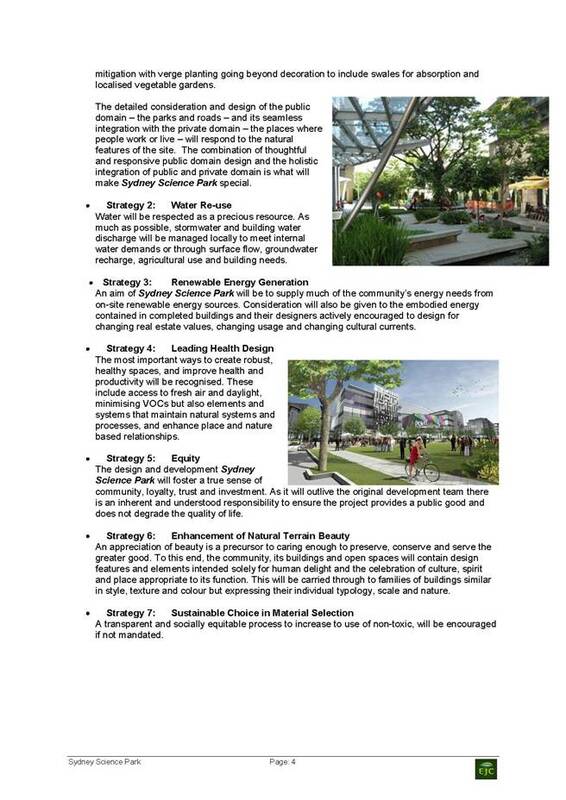 Stage 2 primarily covers the residential, local/neighbourhood centres, and release areas.? Stage 2, known as Planning Proposal for Penrith LEP also incorporates a number of specific rezoning proposals. The Gateway Determination required the Stage 2 Planning Proposal to be exhibited for a minimum period of 28 days (4 weeks).? However, Council resolved on 19 November 2012, to extend the exhibition period to 8 weeks. 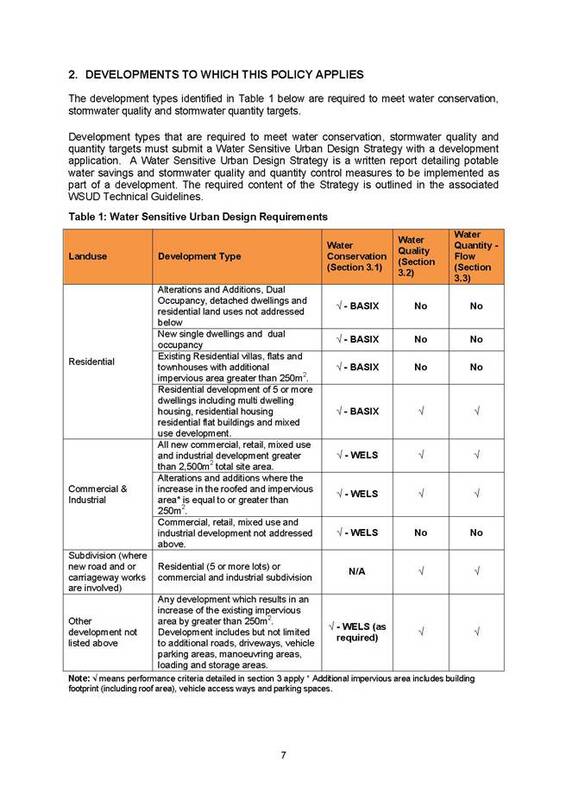 The submissions received during the exhibition period for the Planning Proposal are summarised in the Table below.? a.?? Council delay a decision on the land within the Penrith Health and Education Precinct proposed to be zoned B7 Business Park.? b.?? Council not forward the Planning Proposal delivering Stage 2 of the City-wide Local Environmental Plan to the Minister for Planning and Infrastructure until after its February 2014 Ordinary Meeting in order to analyse the outstanding matters relating to the zone proposed for this land. c.?? Council organise a stakeholder meeting involving Councillors, Council officers, relevant land holders, the Penrith Business Alliance and representatives of the Department of Planning and Infrastructure to investigate and test an alternative selection of appropriate land use zones. Council also requested that officers seek advice from the Department of Planning & Infrastructure on how Council?s resolution can be facilitated through the current Gateway process. A letter was sent to the Department of Planning and Infrastructure on 28 November 2013 seeking advice on this matter in accordance with Council?s request. The Acting Deputy Director General of the Department of Planning & Infrastructure has requested that Council forward the bulk of the Planning Proposal that has been adopted by Council to the Minister for Planning to minimise delays in processing the Planning Proposal and preparing the associated Local Environmental Plan. The Acting Deputy Director General has also indicated support for Council?s intent to review the zones that have been applied to the Business Park component of the Penrith Health and Education Precinct. He also notes that any material change to the exhibited zones will require re-exhibition for the minimum period of 2 weeks. This will enable this matter to catch up with the rest of the LEP while the Department progresses the LEP.? Council officers are awaiting this advice in writing.? 1.????? Council officers will continue to update the Planning Proposal, written instrument and associated maps based on the policy direction endorsed by Council. 2.????? Council officers will forward the Planning Proposal to the Minister for Planning and Infrastructure to make the plan. 3.????? Council officers will liaise with the Department of Planning and Infrastructure and negotiate any changes sought by the Department in the lead up to the writing of the instrument by Parliamentary Counsel. 4.????? Council officers will liaise with Parliamentary Counsel in writing the instrument and do any mapping changes required. 5.????? The Minister for Planning and Infrastructure will make the plan. 1.???? The information contained in the report on Planning Proposal for Penrith Local Environmental Plan be received. 2.?????? The Planning Proposal for Penrith Local Environmental Plan endorsed at the Ordinary meeting of 25 November 2013 be forwarded to the Minister for Planning and Infrastructure (once written advice on the outstanding B7 Business zone matter is received from the Department of Planning & Infrastructure) with a request that the Minister consider the changes made to the Planning Proposal in response to the public exhibition, and make a determination as to whether the Planning Proposal is to be re-exhibited in accordance with s58 of the Environmental Planning and Assessment Act 1979. 3.?????? The Minister be requested to make the plan in accordance with the Environmental Planning and Assessment Act 1979, should he determine that re-exhibition is not required. Rescission of Footpath Construction Development Contributions Plan??? The Footpath Construction Development Contributions Plan (the Plan) took effect in May 2001 and applies to established residential areas.? The Plan levies contributions to provide additional footpaths required to meet the needs of population increases arising from additional residential development. While we reviewed our s94 plans and processes, the Department of Planning and Infrastructure (DP&I) undertook the same exercise at the State level. Since 2009, new DP&I? processes have required councils to review their plans; mandated that new or amended s94 plans be approved by DP&I; and capped residential contributions. More recently, DP&I revealed proposed changes to development contributions in the White Paper on the NSW Planning System. The changes included restricting the local infrastructure councils would be permitted to fund through development contributions. Footpaths were not included among the local infrastructure for which councils could levy. The implications of this proposed change are discussed later in this report. Given that all the projected contributions have now been collected and spent in accordance with the s94 Plan, it is timely and legally appropriate that it be rescinded. All contributions plans need to be reviewed regularly to ensure they are complying with ? and not exceeding ? the provisions of the Plan and relevant legislation, DP&I Best Practice Guidelines and legal precedents. A key principle underpinning contributions planning practice is reasonableness. It would be unreasonable for the existing Footpaths Construction s94 Plan to continue applying now that projected contributions have been paid. 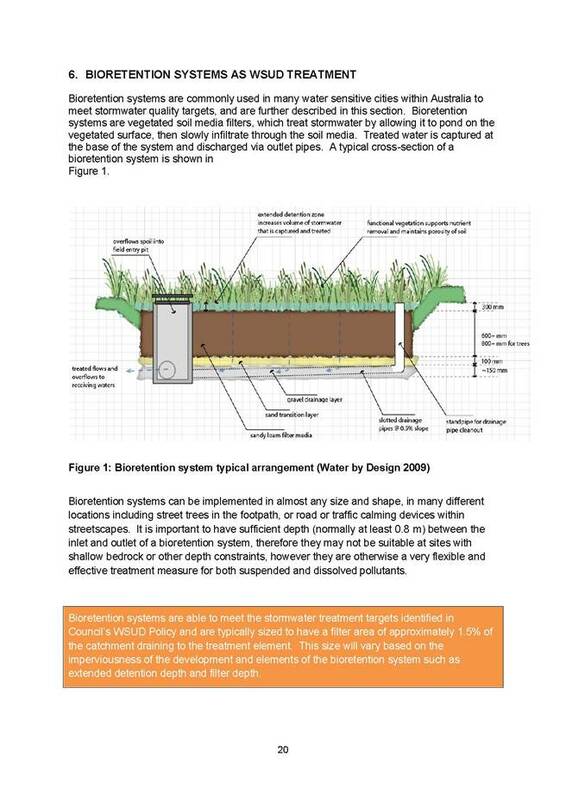 If any further contributions are received under the s94 Plan (through older development consents yet to be acted upon), these contributions will be used on yet to be built footpaths described in the Plan. This approach is consistent with legal advice and Council?s position regarding other rescinded s94 plans. -???? ?????? approximately $200,000 in Great River Walk grants from the NSW government. Typically, when a contributions plan arrives at the end of its programmed life and has delivered its projected infrastructure, it is reviewed to determine whether a new plan should be prepared. 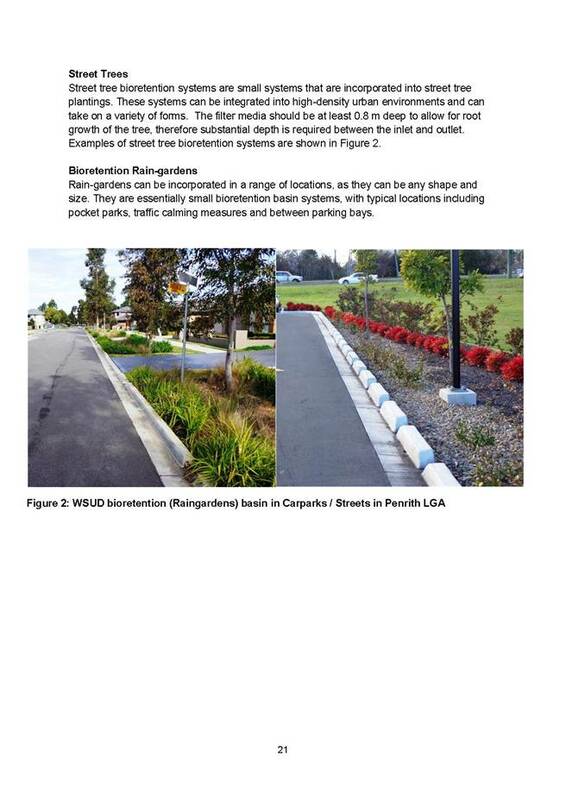 In a very large LGA such as Penrith City, where many streets in established suburbs are without pathways, it would normally be the case that a revised version of the current Footpaths Construction s94 Plan is prepared and adopted. 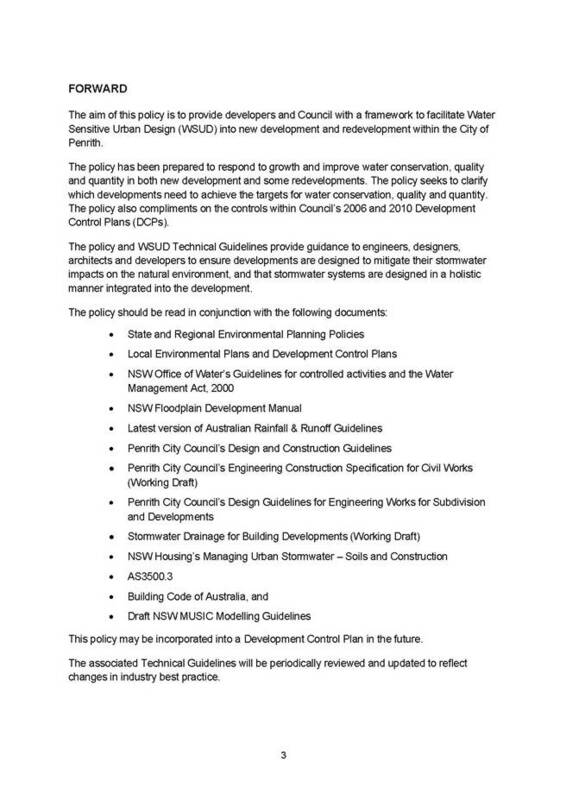 However, recent changes to the NSW Planning System outlined in the White Paper, indicate that upon release of the new Planning Bill council?s will no longer be able to apply contributions towards the provision of footpaths. Given that the new Planning Bill is expected to be enacted by early 2014, it would be inefficient and inappropriate to spend resources preparing a new Footpaths s94 Plan until DP&I have confirmed whether councils will retain their ability to impose contributions for additional footpaths. Council?s Senior Legal Officer has reviewed the merits of rescinding the Footpaths Construction s94 Plan and confirms that the rescission is appropriate and would not expose the Council to unreasonable legal risk. Council?s City Works Manager coordinates the delivery of new footpaths in areas affected by the Footpath Construction s94 Plan and has ensured that contributions have been spent in accordance with the Plan?s provisions. The City Works Manager raises no objections to rescinding the current Footpath Construction s94 Plan nor to delaying preparation of a new Plan until release of the new Planning Bill. If Council resolves to rescind the Footpath Construction Contributions Plan, the next step in the process would be to display two notices in the local newspaper advising the community firstly of Council?s resolution and in the second notice, the date on which the rescission takes effect. 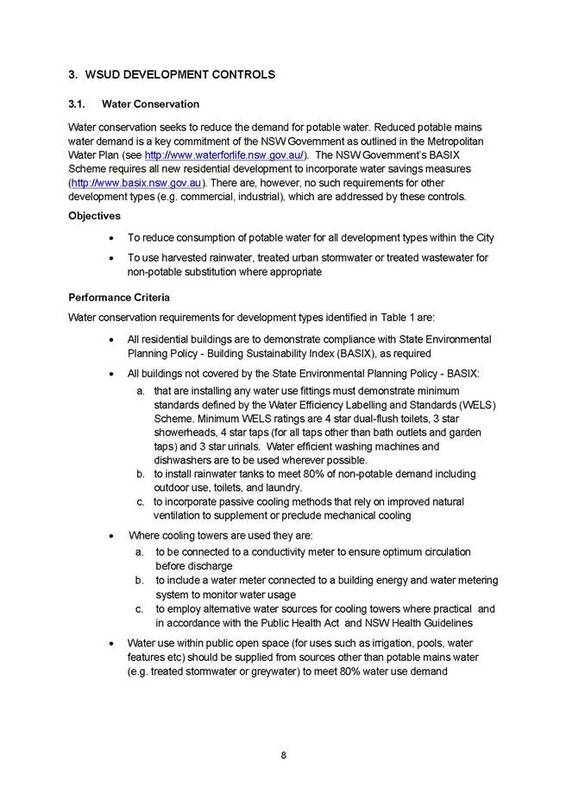 The s94 Plans would be rescinded on the date that the second notice appears in the newspaper. 1.???? The information contained in the report on Rescission of Footpath Construction Development Contributions Plan be received. 2.???? Council resolve to rescind the Footpath Construction Development Contributions Plan. 3.???? Notices appear in the local newspaper advising the community of the rescission of the Plan, in accordance with the requirements of the Environmental Planning & Assessment Act and Regulations, with rescission taking effect upon appearance of the second Notice. 4.???? 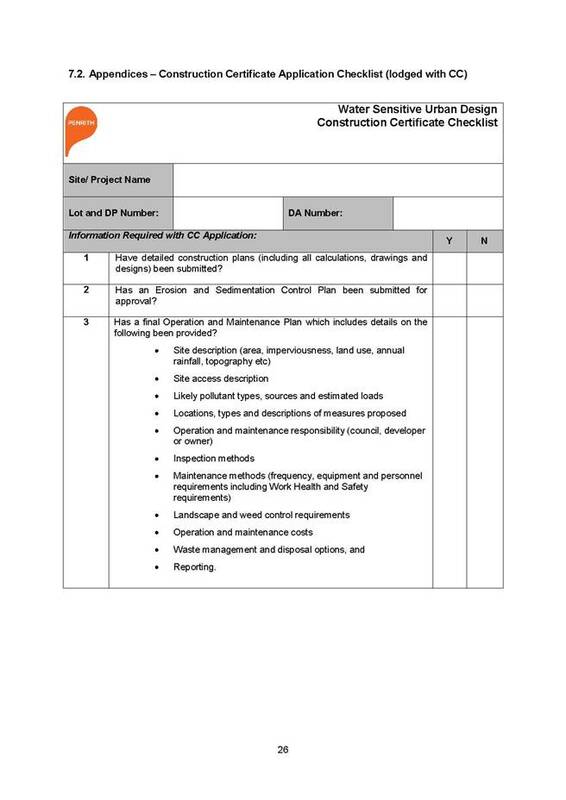 If any further Footpath Construction Contributions Plan contributions are received in relation to existing development consents, these be allocated to additional path construction, consistent with those locations described in the Plan. 5.???? Review of the need for a new Footpath Construction s94 Plan be deferred until after the release of the new NSW Planning Bill. 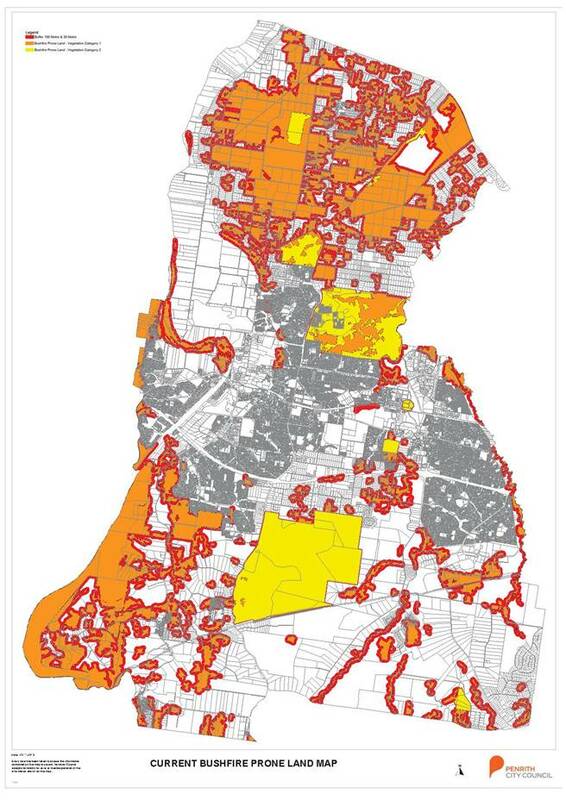 Amendments to Council's Bushfire Prone Land Map??? In 2002 legislation was introduced to enhance bushfire protection measures implemented during the development assessment process. This legislation required all Council?s to map their bush fire prone lands (BPL), with maps to be reviewed every five (5) years. Council?s map was reviewed in 2006 and Council officers have just concluded the process of reviewing it again in partnership with the Rural Fire Service (RFS). The draft amended BPL map was presented at the 2 December Councillor Briefing. It is now recommended that the amended map be referred to the Commissioner of the Rural Fire Service along with a letter from Council formally requesting that the map receive the Commissioner?s endorsement and certification. The legislation required all Councils to prepare a Bushfire Prone Land (BPL) Map. The Commissioner of the Rural Fire Service (RFS) designates what constitutes BPL and how it is to be mapped. In 2002, Council prepared a map in accordance with the guidelines and submitted it to the Rural Fire Service (RFS) for approval by the Commissioner. These maps are required to be updated every 5 years. Council?s map was last revised in 2006. A revised BPL map has been prepared in consultation with the Local Community Safety Officer of the RFS, and Council Officers which has assessed the lands in the Local Government Area. A draft of the revised map has been prepared. This map is required to be adopted by Council before it is presented to the Commissioner of the RFS for endorsement and certification.? 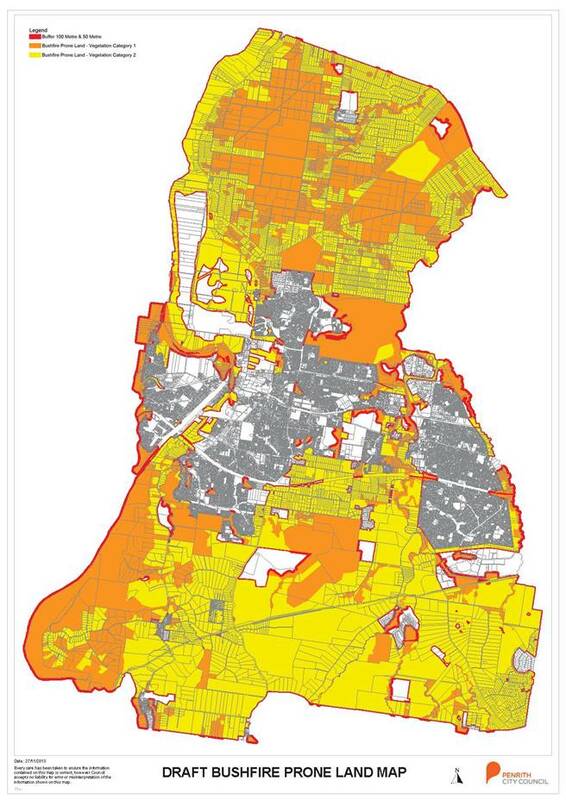 Appended are the current BPL Map and the draft of the revised map (Appendix 1 & Appendix 2).? Provided to Councillors under separate cover are A3 copies of maps. The Environmental Planning and Assessment Act 1979 contains the legislation requiring Councils to prepare BPL maps and to consider the risk from bushfire to development during the assessment process. 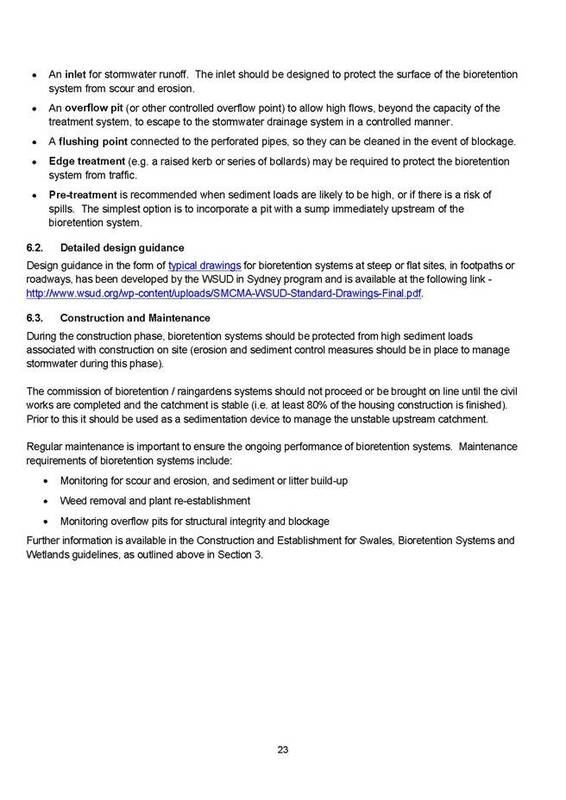 The guiding document called up by the legislation, Planning for Bush Fire Protection (PBP), applies to all ?development applications? on land that is classified as BPL and identified on Council?s BPL map as required by Section 79BA. ????? If the development proposed is for subdivision of bush fire prone land for residential or rural residential purposes, or is for a special fire protection purpose including; a school, a child care centre, a hospital, a hotel, motel, or tourist accommodation, seniors housing, a group home, or a retirement village, it will require an Integrated Development Approval from the RFS. 1.?? Large bushland areas which have transitioned into residential subdivisions including Jordan Springs, Claremont Meadows and Glenmore Park and are no longer bushfire prone. 2.?? Regeneration of bushland surrounding existing subdivisions meaning some areas which are not currently identified as bushfire prone now need to be considered as being bushfire prone. In addition to this; following the 2009 Victorian Bushfires, significant changes were made to Australian Standard 3959 ?Construction of buildings in Bushfire Prone areas? and the ability of grassland areas to convey bushfires into areas of residential development was recognised. The adoption of AS3959-2009 on 1 May 2012 required Councils to consider the impacts of grasslands on any new developments as well as incorporate grassland when updating their bushfire prone land maps. ???? Case law confirms there have been no successful claims against a Council decision to identify a property as being bushfire prone resulting in a reduction of the value of a property or limiting its development potential. ???? Neither have there been any successful challenges to a decision by a Council to identify property as being bush fire prone which may serve to increase insurance premiums for property owners. ???? The other potential liability risk is in an alleged failure to identify land as bush fire prone in the mapping process. For example, an allegation by a landowner that the failure to map a property as bush fire prone resulted in damage as specific controls to limit bush fire risk were not applied and the property was later destroyed by fire. It is therefore proposed that, once certified, the amended BPL map is notified to the community and rate payers via advertisements in the Mayoral Column and Western Weekender with a display on Council?s web page and hard copies of the map available for viewing at Council?s Penrith and St Marys offices. Once the BPL map is certified, information regarding the amendments to the mapping will be communicated to the community via Council?s website and the Local Press. 1.???? The information contained in the report on Amendments to Council's Bushfire Prone Land Map be received. 2.???? The amended bushfire prone map be adopted by Council. 3.???? The adopted map be referred, with an accompanying letter, to the Commissioner of the Rural Fire Service requesting its endorsement and certification. 4.???? Once the map has been certified by the Commissioner of the Rural Fire Service, the communication strategy outlined in the report be implemented. 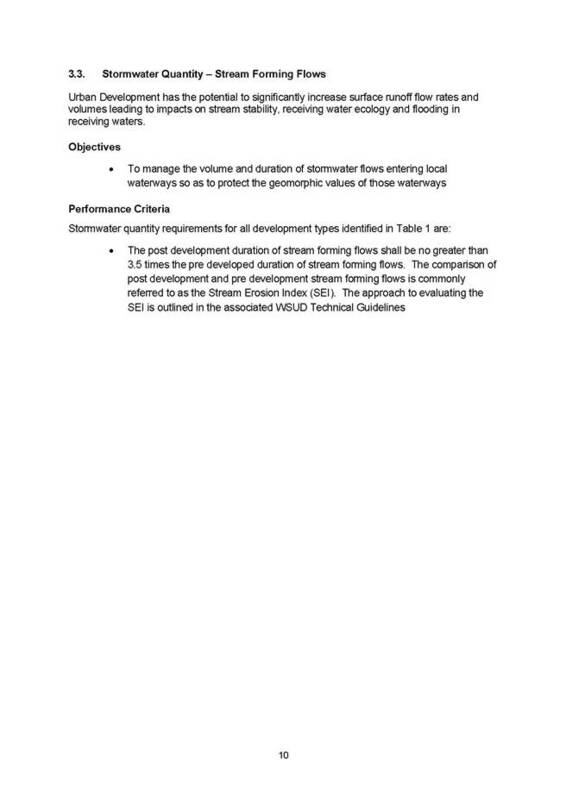 IPART Draft Report on Local Infrastructure Benchmark Costs??? Authorised by:??????????? Paul Grimson, Strategic Planning Manager?? This report seeks Council?s endorsement to make a submission to the Independent Pricing and Regulatory Tribunal (IPART) regarding its draft report on local infrastructure cost benchmarks. 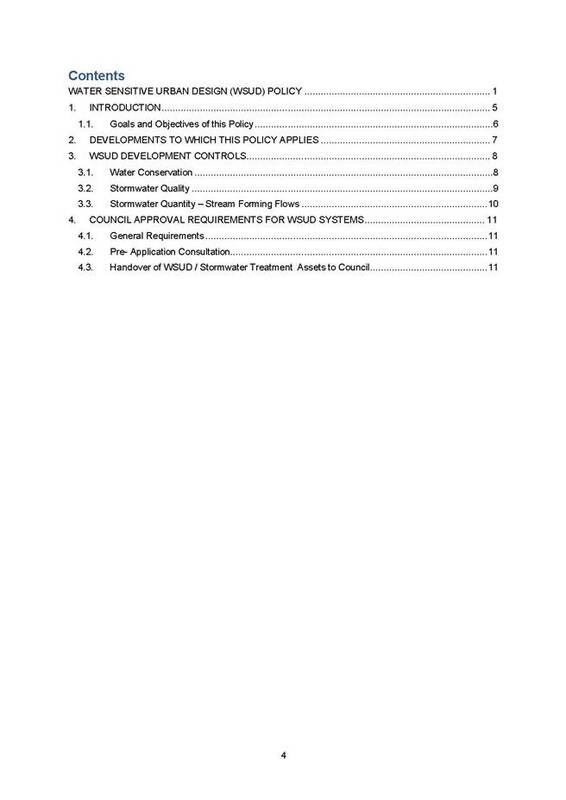 On 25 November 2013 IPART released a draft report on local infrastructure benchmark costs and sought public comment. 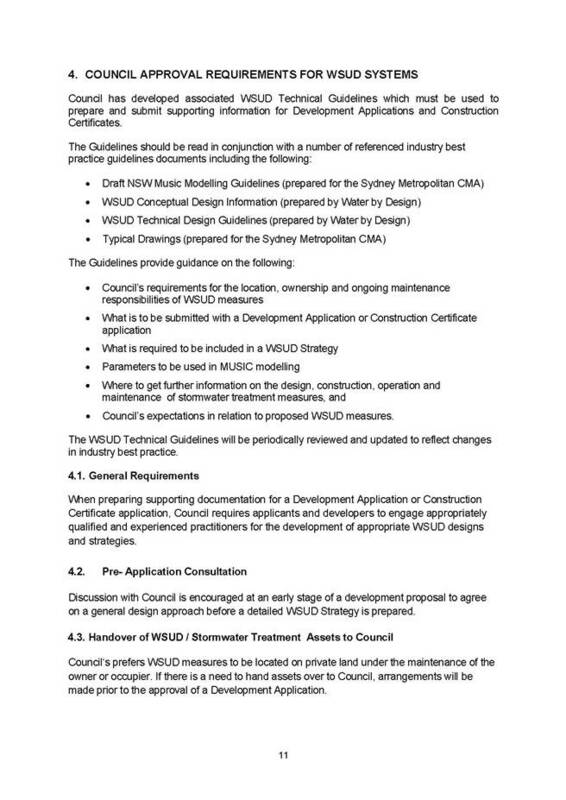 This draft report was prompted by the Government?s recently published White Paper reforms to the NSW planning system.? These reforms include revised arrangements for infrastructure contributions.? 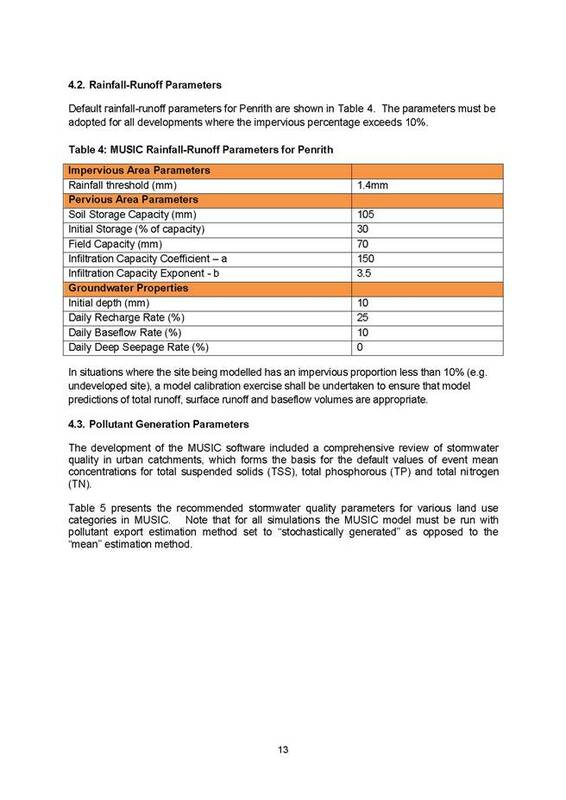 IPART?s report establishes proposed benchmark costs for particular ?standard? 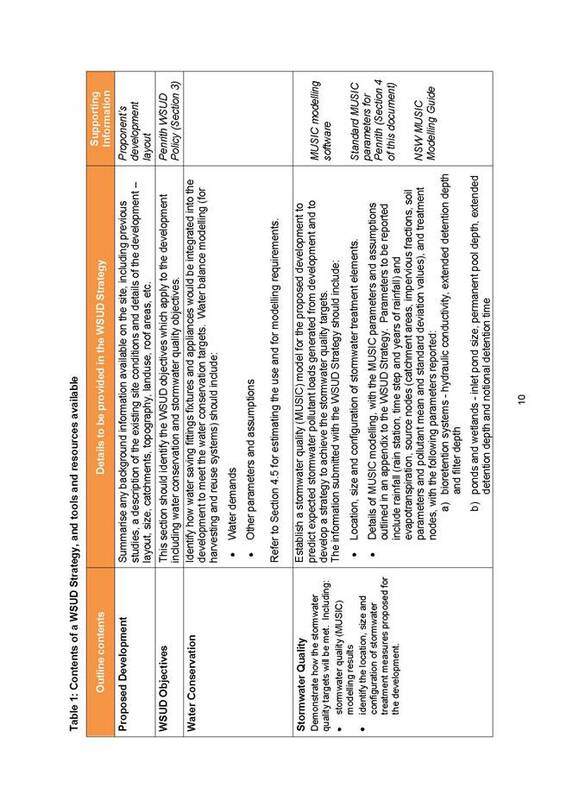 infrastructure items described in the Planning White Paper.? The deadline for submissions is 17 January 2014, which occurs within the period of Council?s recess.? We are currently examining the draft report with a view to making a submission by the due date.? However, the document runs to 166 pages and will require extensive interrogation and comparison of costings by officers from across the organisation.? There has been insufficient time available to complete this review and present a submission to Council ahead of the Christmas recess. 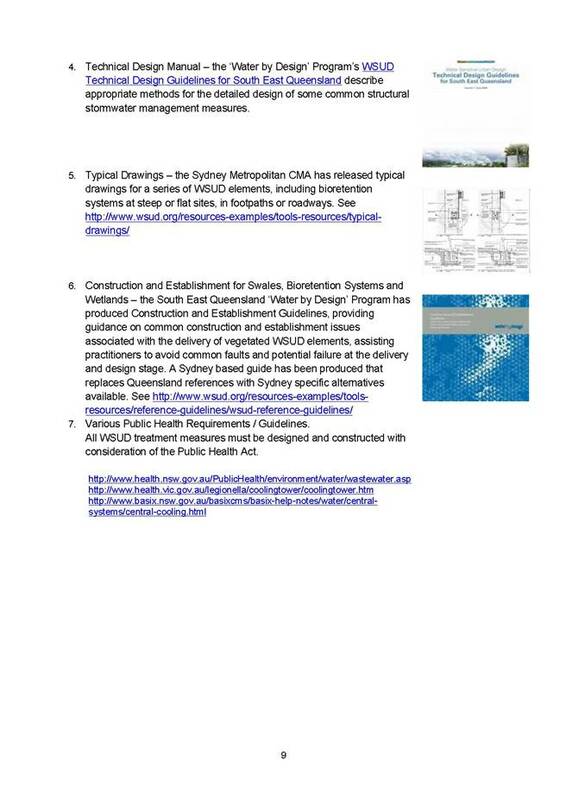 The Government recently published a White Paper on reforms to the NSW planning system.? These reforms include revised arrangements for paying for growth infrastructure.? As part of these reforms, the Government has decided to remove the cap that previously applied to the infrastructure contributions that developers pay to local councils. In the new system, councils will be able to levy an uncapped contribution towards the efficient cost of local roads and transport facilities, local open space, community facilities and stormwater management works.? The White Paper proposed that the costs of items included in Local Infrastructure Plans will be standardised in accordance with benchmarks agreed by the Infrastructure Contributions Taskforce.? There is therefore a need to develop relevant benchmarks. IPART was requested to assist the Department of Planning and Infrastructure (DP&I) by investigating local infrastructure cost benchmarks or appropriate processes that councils can use to estimate the efficient costs of local infrastructure.? As part of this work, matters such as regional cost variations, how to value land and how to keep costs up to date, were examined.? IPART has prepared a draft report with input from stakeholders including local councils.? A draft report titled Local Infrastructure Benchmark Costs: Costing infrastructure in Local Infrastructure Plans was released by IPART on 25 November 2013.? Written comments have been invited and submissions are due by 17 January 2014. In undertaking the exercise IPART engaged engineering and construction experts, Evans & Beck.? They also consulted a number of stakeholders including the Infrastructure Task Force, councils, developers and other industry experts.? On 7 November 2013 Council officers provided very detailed input to questionnaires sent to each council by IPART regarding the costs, methodology, apportionment, etc, for our current and past contributions plans in the lead up to the draft report. 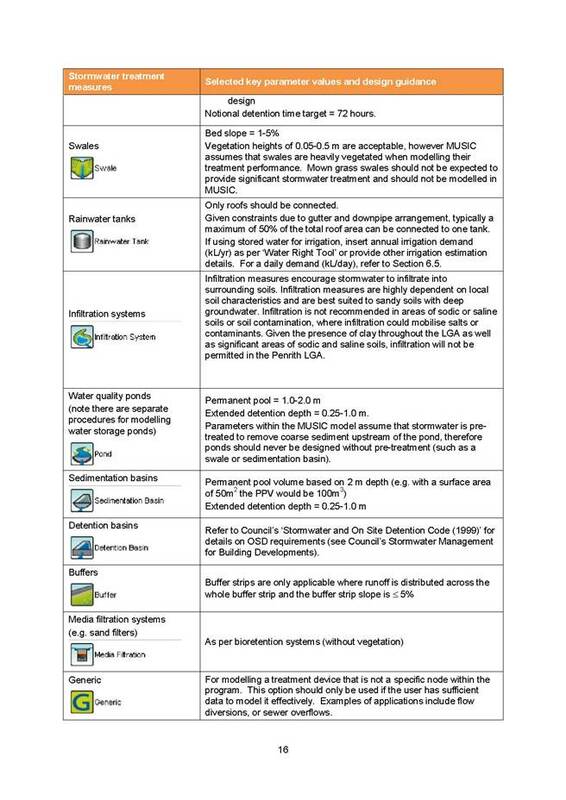 IPART?s draft Local Infrastructure Cost Benchmarking report describes a facility (eg, multi purpose community facility), describes its components (eg, floorspace, inclusions such as fitout details) and elements the costing does not include (eg, contamination remediation). A facility cost per unit (eg, price per square metre) is then described. 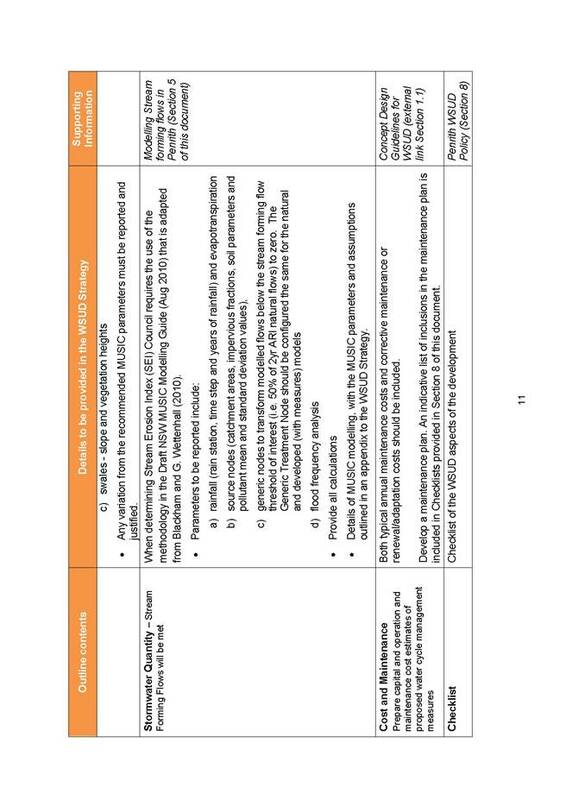 The cost benchmarks will then be applied by Council and the DP&I when development contributions plans ? and the facilities they include are being developed or reviewed. If councils wish to prepare development contributions plans which vary from these benchmarks they will need to provide justification to the DP&I.? 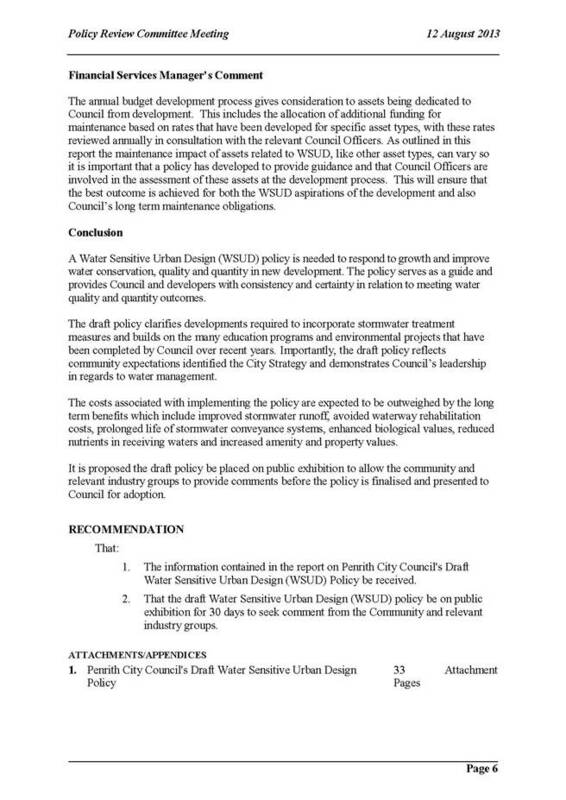 IPART?s draft report has been referred to relevant Council specialists for analysis and comment. This staff review will inform and shape our submission.? Given that the deadline for submissions (17 January 2014) will occur outside Council?s 2014 meetings schedule, this report seeks Council endorsement for staff to make a submission on its behalf.? While the impact on Council of the draft benchmark costs cannot be quantified at this stage, the tenor of our response will seek to continue Council?s consistent position of advocating for flexibility in providing essential local infrastructure that meets the needs of our particular community and is financially sustainable for us to maintain.? The benchmarking of local infrastructure items has the potential to have a significant impact on our local community, the achievement of our strategic goals and sustainable financial management.? Given these implications, it is imperative that we make a submission on IPART?s draft benchmark report.? Council endorsement of a staff submission on Council?s behalf will ensure we continue to advocate for the delivery of affordable and appropriate local infrastructure. 1.???? The information contained in the report on IPART Draft Report on Local Infrastructure Benchmark Costs be received. 2.???? Council endorse the making of a submission by staff regarding IPART?s draft Report on Local Infrastructure Benchmark Costs by 17 January 2014. 3.???? A copy of the submission forwarded to IPART be provided to Councillors at the end of the Christmas recess period. Compiled by:?????????????? Schandel Jefferys, Senior Planner? E.J Cooper and Son Pty Ltd (EJC) is owned by the Baiada family group of companies and is one of Australia?s largest privately owned companies.? EJC has an annual turnover of approximately $2 billion, employs over 6,000 and is based in Western Sydney.? EJC?s vision is to develop the Sydney Science Park which is a unique development for Australia.? 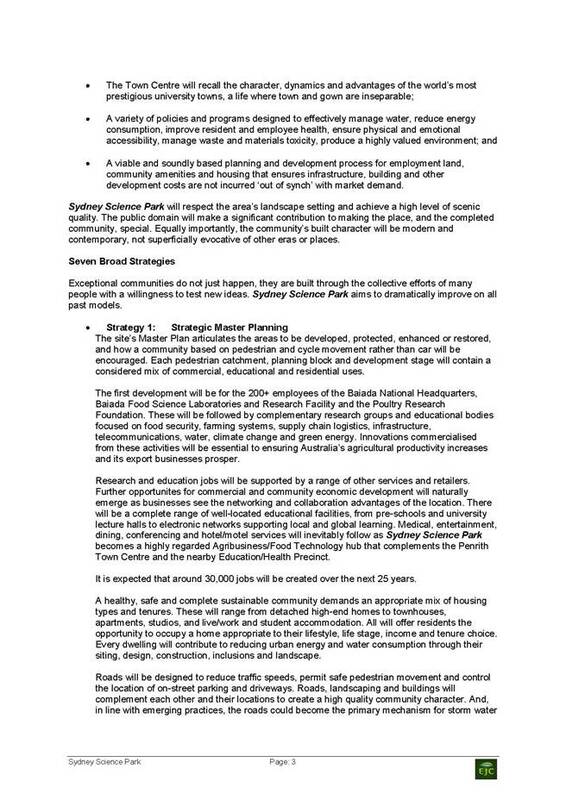 The Sydney Science Park seeks to create a higher order employment centre integrating research and development, employment, education, student accommodation and office space.? The land is predominantly within the boundaries of the Broader Western Sydney Employment Area (BWSEA).? 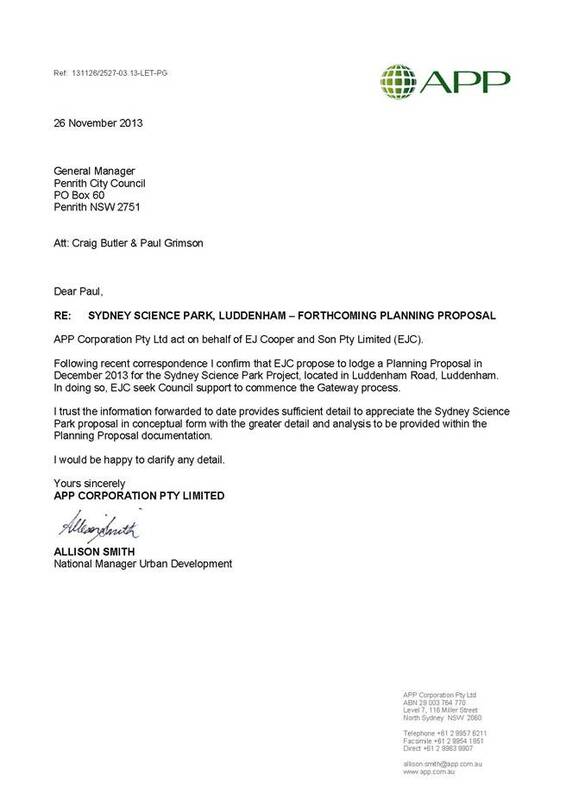 On 1 August 2013 the proponent of the Sydney Science Park, E. J. Cooper and Son Pty Ltd (EJC), formally met with Council officers to present their Planning Proposal which sought to rezone land at Luddenham Road, Luddenham for mixed use employment, science, technology and residential development.??? EJC is owned by the Baiada family group of companies, which owns a significant landholding in the Broader Western Sydney Employment Area (BWSEA).? EJC employs over 6,000 staff, has an annual turnover of approximately $2 billion and is based within Western Sydney.? 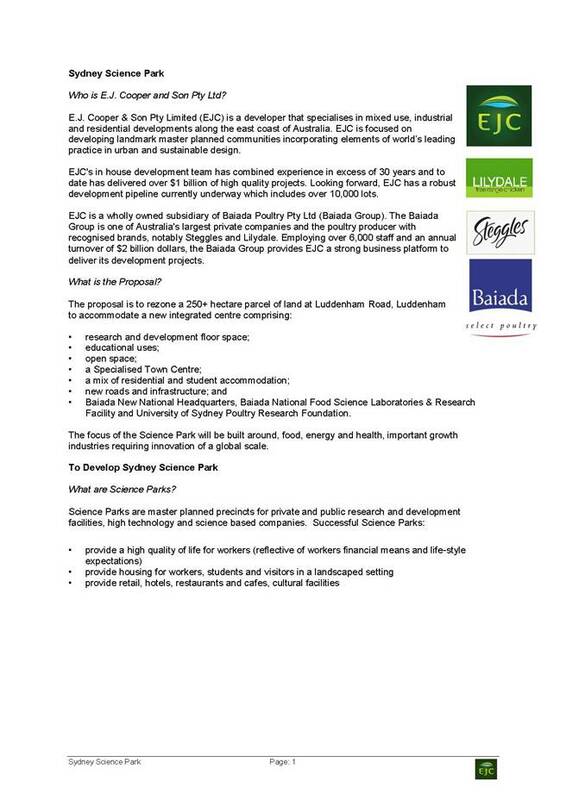 EJC?s vision is to develop the Sydney Science Park which is a unique development in Australia.? 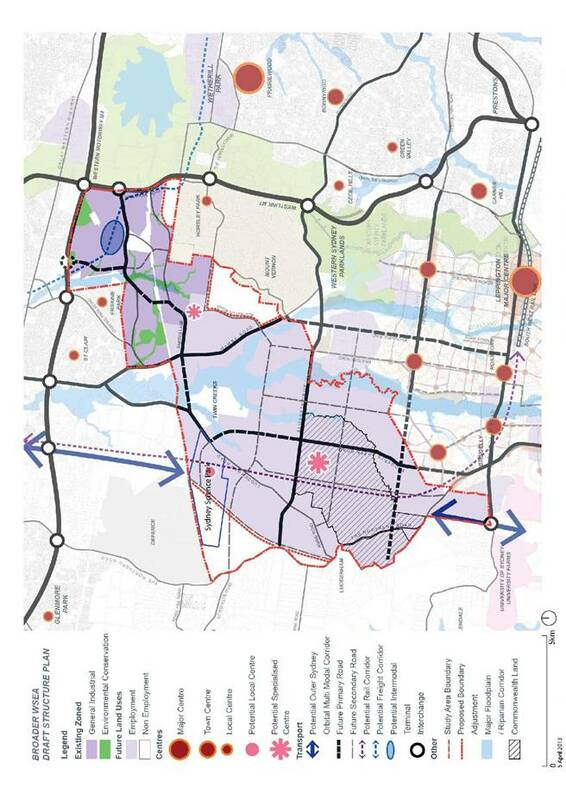 Initially the proposal sought to rezone 413 hectares of land to create a higher order employment centre, integrating research and development, employment, education and a residential precinct.? 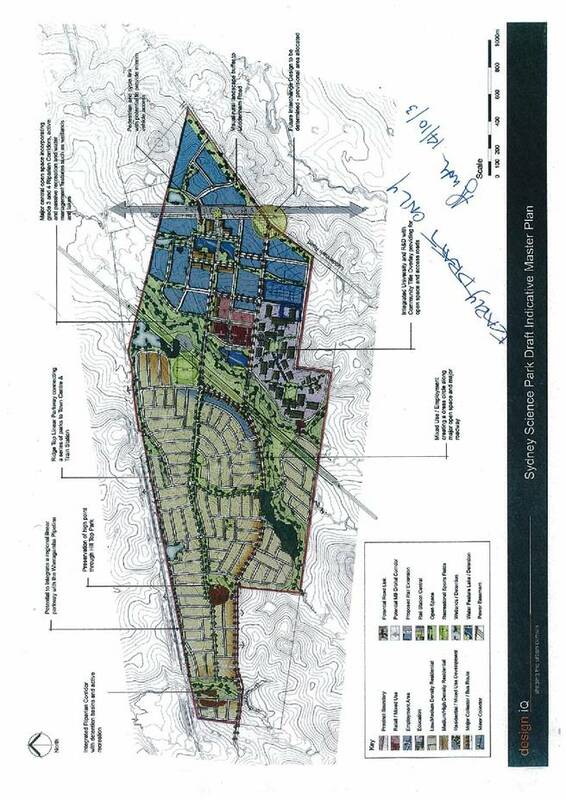 The residential component was to comprise approximately 3,000 new dwellings in a traditional residential subdivision pattern as shown in the concept plan in attachment 1.? The vast majority of the residential component that was originally proposed falls outside the boundary of the BWSEA.? Since the initial discussions and, more recently, key meetings with the Department of Planning and Infrastructure (DP&I), the components of the Planning Proposal have been revised as described below.? EJC?s total landholding at Luddenham Road, Luddenham is approximately 413 hectares with half of this land located within the BSWEA.? The revised proposal incorporates only the development of approximately 250 hectares on the eastern side of, and within, the BWSEA boundary.? The traditional residential component outside of the BWSEA has now been deleted from the proposal. The proposal is for a research and development centre specialising in the food, health and energy sectors.? EJC?s vision is the delivery of higher order employment uses in the form of a fully integrated science park including education, research and development, commercial/office space, centre based residential, student housing, retail and town centre uses.? The built form will deliver high quality design with complementary landscape features in a range of 5 to 8 storey buildings. EJC have recently announced they are relocating the Baiada Australian headquarters, Baiada National Food Science Laboratories and Research Facility and University of Sydney Poultry Research Foundation to the site in their initial stage of development.? This commitment will bring 400 to 500 jobs to Penrith with the first development applications.? 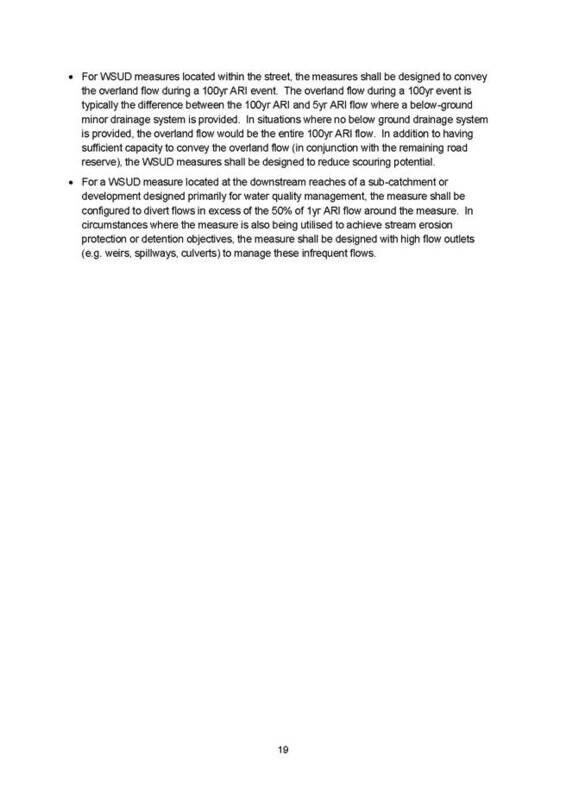 Further details of the proposal are provided by EJC and included in attachment 2.? The Planning Proposal now comprises 250 hectares of land within the BWSEA as shown in attachment 3.? 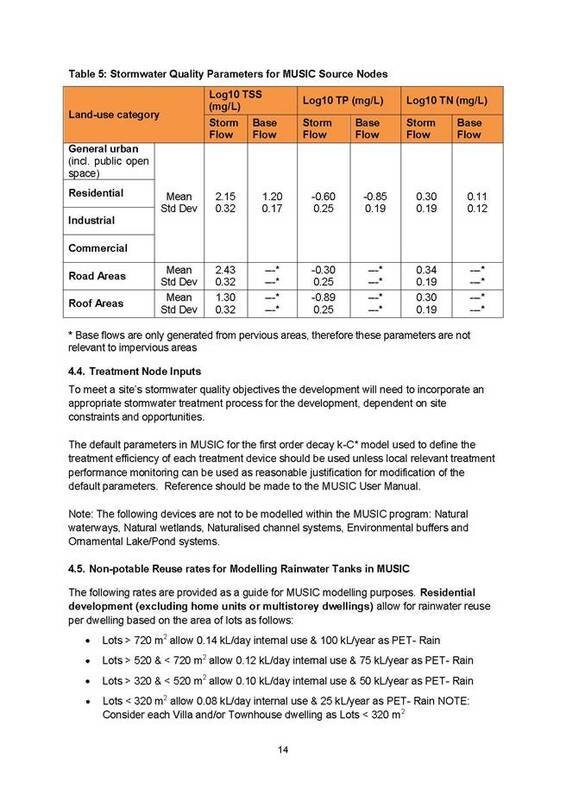 Attachment 4 includes the draft indicative masterplan.? EJC have put forward a written request seeking Council?s support to commence a Gateway process that is required to ultimately rezone the land for the intended purpose.? A copy of this letter is included in attachment 5.? A formal, more detailed Planning Proposal, to be submitted prior to Christmas, will include draft zones, a detailed masterplan and Voluntary Planning Agreement.??? 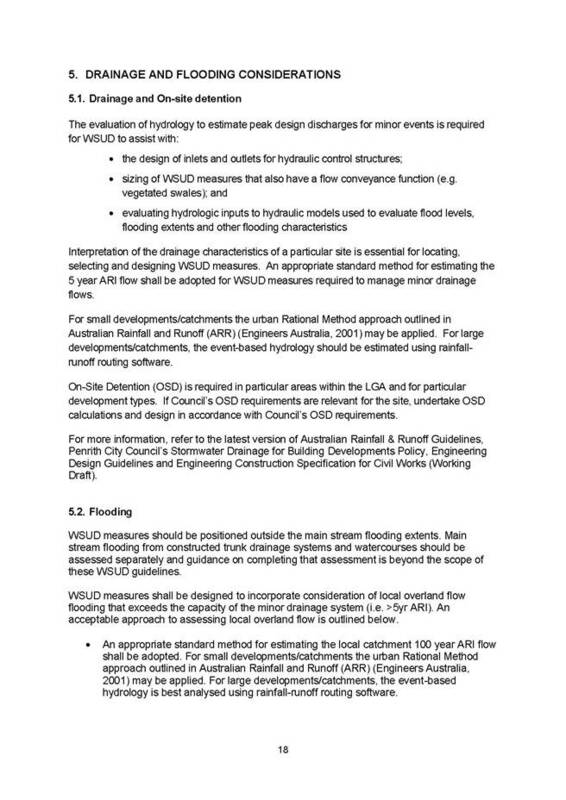 The final BWSEA draft Structure Plan has not yet been published but is likely to come into effect early in 2014.? At present, the DP&I are working through the submissions received during the recent public exhibition and further visual impact analysis.? The BWSEA Structure Plan will then move into a staged detailed precinct planning phase with Stage 1 starting at the north eastern corner with an extension to the existing employment area.? 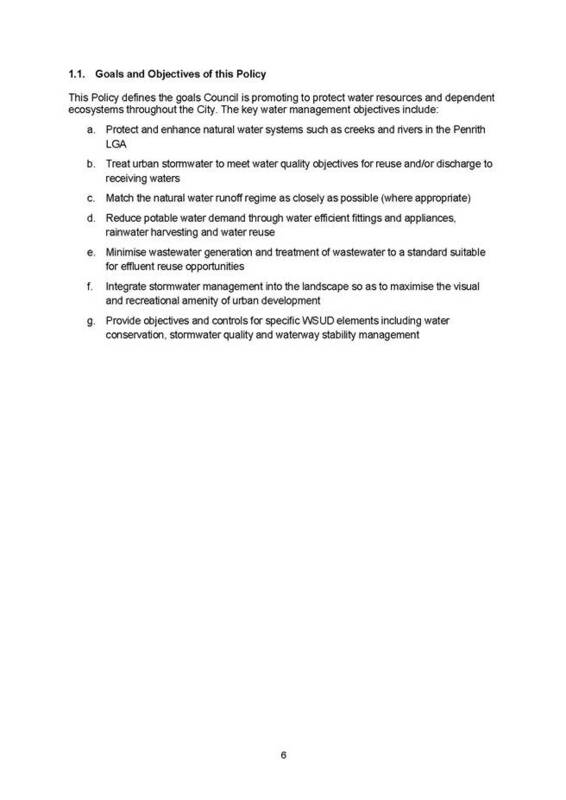 EJC would like to progress their development ahead of the staging outlined in the BWSEA draft Structure Plan.? They have approached Council to consider a Planning Proposal to permit their development ahead of the State Government process. Although the proposal is out-of-sequence this approach has the support of the DP&I.?? A detailed Planning Proposal is due to be submitted in the coming weeks.? 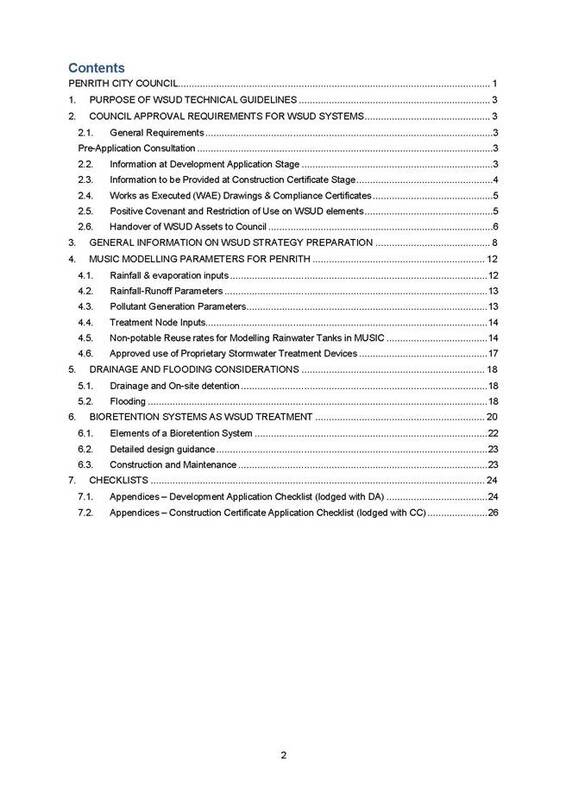 A wide range of technical studies/reports will also accompany and support the Planning Proposal as set out in the following table:? Various meetings with DP&I, Council staff and other stakeholders are scheduled for the coming months.? The DP&I are in the process of establishing a committee of the major service providers to assess the major infrastructure requirements and delivery of this proposal.? The EJC proposal offers an exciting, robust and unique opportunity to set the tone of future development in the BWSEA in terms of the density and nature of the employment proposed and the intended quality an integration of the development.? It is recommended that Council resolve to commence a Gateway process through the DP&I to allow the next stages of planning to progress with confidence.? It should be noted however, that such a resolution does not lock Council into an ultimate decision on the rezoning of the site. 1.???? 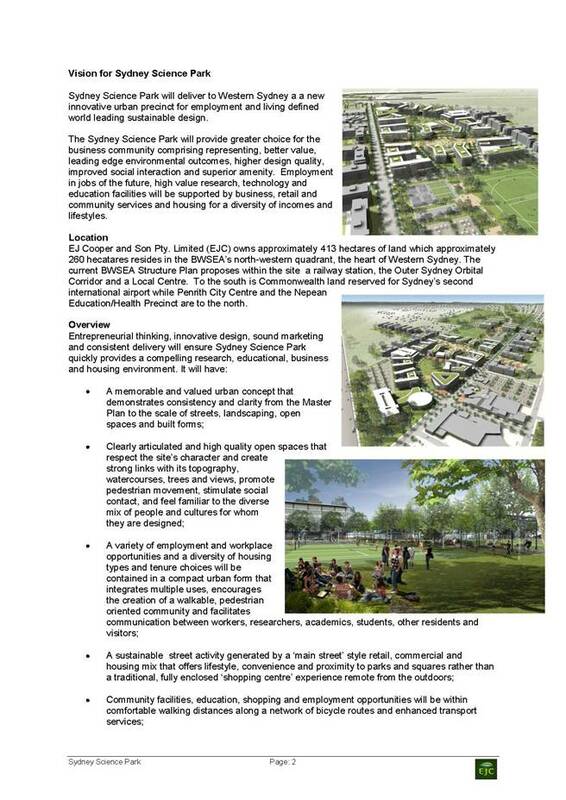 The information contained in the report on Sydney Science Park be received. 2.???? 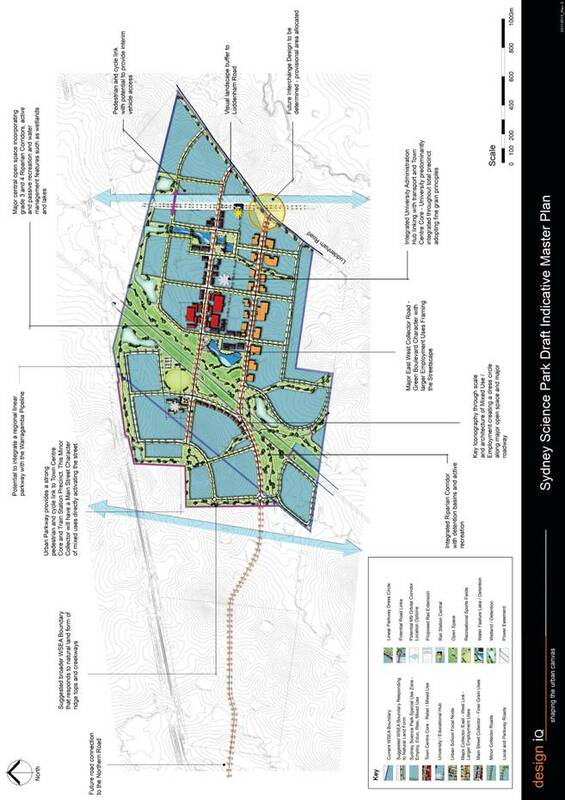 Council commence a Gateway process for the ultimate consideration of a Planning Proposal for the Sydney Science Park in accordance with the requirements of the Environmental Planning and Assessment Act 1979. 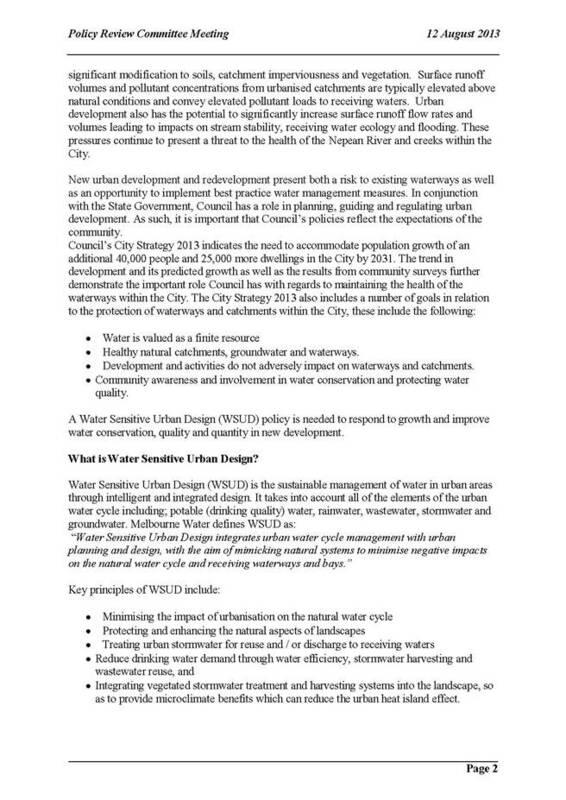 Water Sensitive Urban Design (WSUD) Policy??? Authorised by:??????????? Graham Liehr, Environmental Health Manager ?? 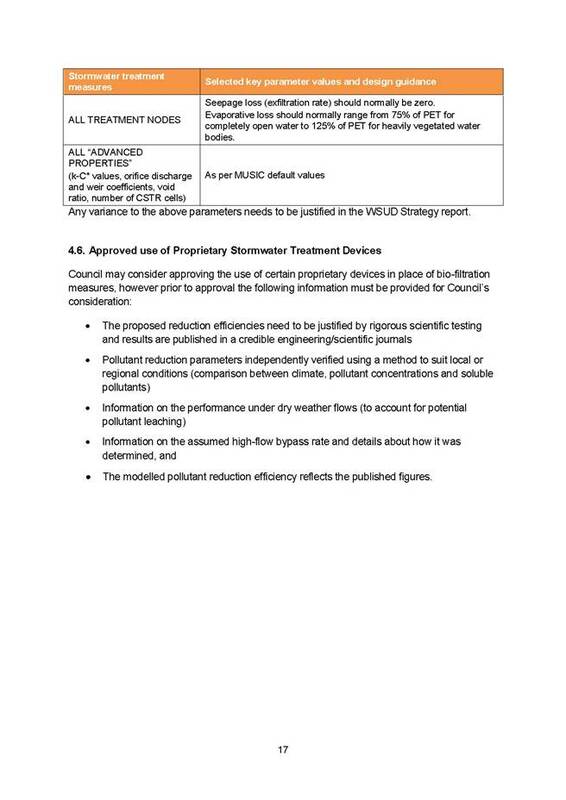 The draft policy was presented at Council?s 12 August 2013 Policy Review Committee Meeting (report is included as an attachment). The policy was subsequently placed on public exhibition from Monday 2 September to Friday 11 October 2013 to allow comment from the community and relevant industry. 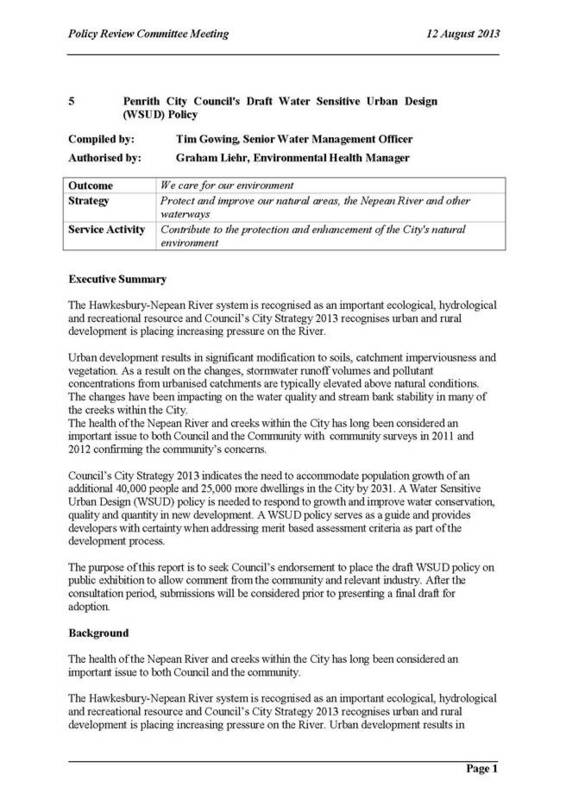 The Hawkesbury-Nepean River system is recognised as an important ecological, hydrological and recreational resource and Council?s City Strategy 2013 recognises urban and rural development is placing increasing pressure on the River. 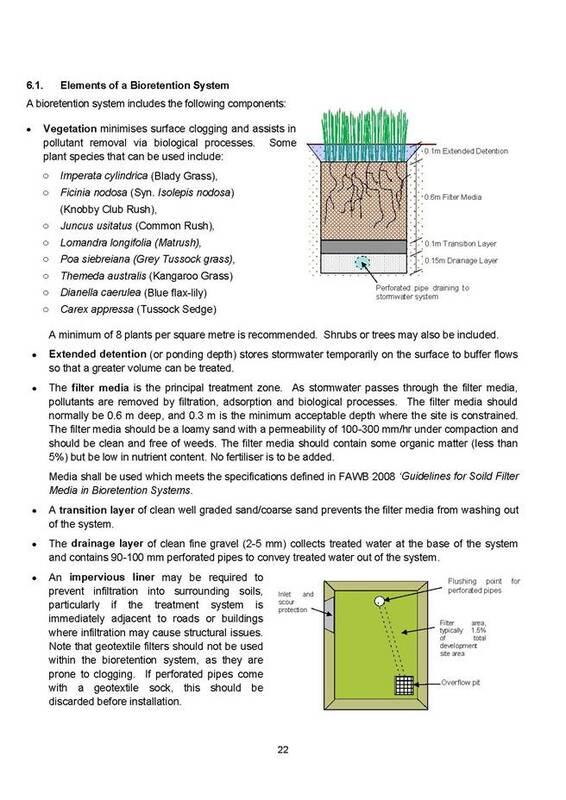 Urban development results in significant modification to soils, catchment imperviousness and vegetation.? Surface runoff volumes and pollutant concentrations from urbanised catchments are typically elevated above natural conditions and convey elevated pollutant loads to receiving waters.? Urban development also has the potential to significantly increase surface runoff flow rates and volumes leading to impacts on stream stability, receiving water ecology and flooding. These pressures continue to present a threat to the health of the Nepean River and creeks within the City. 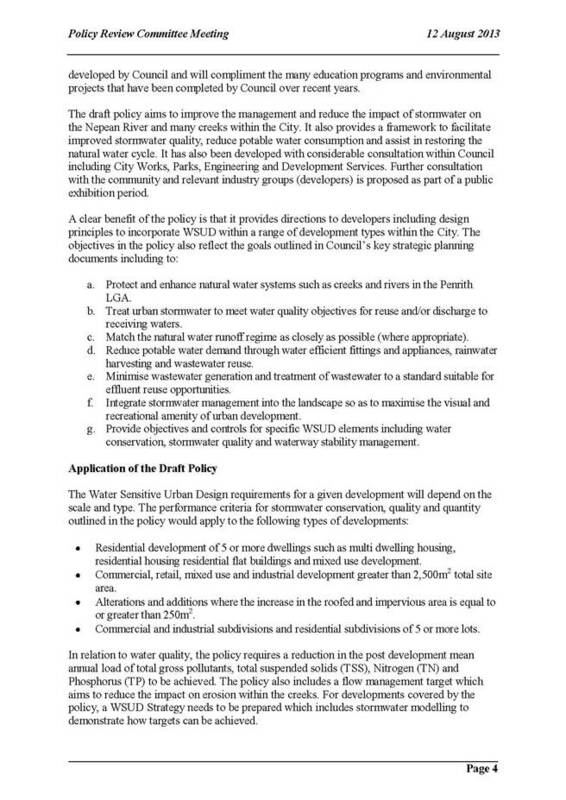 New urban development and redevelopment present both a risk to existing waterways as well as an opportunity to implement best practice water management measures. In conjunction with the State Government, Council has a role in planning, guiding and regulating urban development. As such, it is important that Council?s policies reflect the expectations of the community. 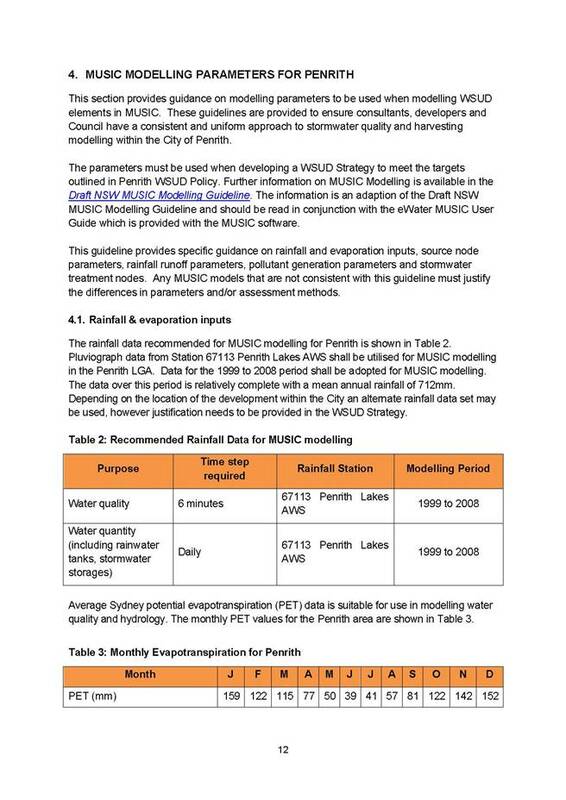 The Water Sensitive Urban Design (WSUD) policy is intended to respond to growth and improve water conservation, quality and quantity in new development. 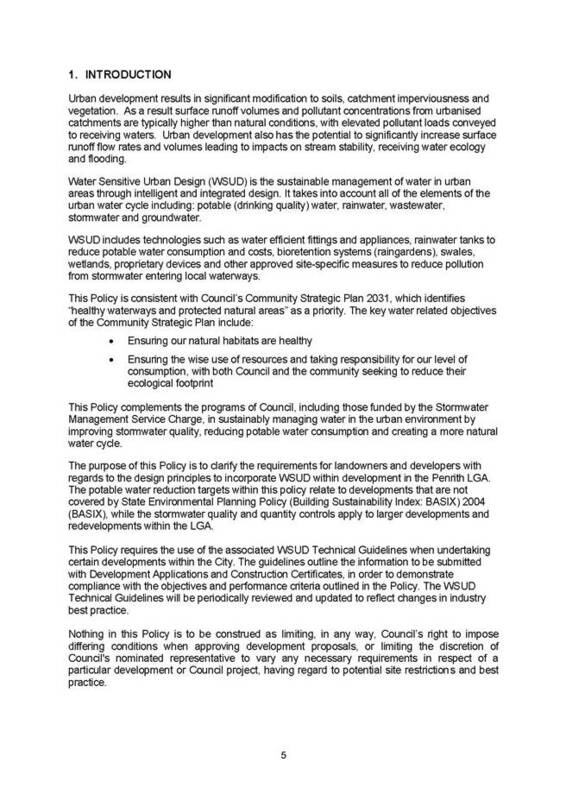 The report presented at Council?s Policy Review Committee meeting of 12 August 2013 is attached and includes additional details on the importance and need for the policy. 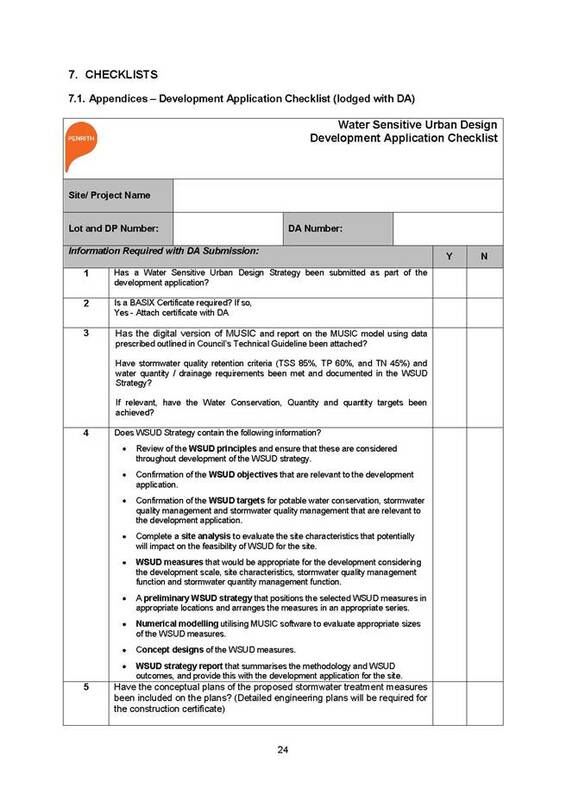 Council resolved at that meeting to place the draft Water Sensitive Urban Design (WSUD) policy on public exhibition for 30 days to seek comment from the Community and relevant industry groups. Consequently, the draft policy was placed on public exhibition from Monday 2 September to Friday 11 October 2013 to allow comment from the community and relevant industry. The policy was made available on Council?s website, and in Council?s administration centres and libraries in Penrith and St Marys. As a result of the consultation, some minor changes to the technical aspects of the policy have been made. The changes made to the policy increase its flexibility so as to ensure the policy does not limit Council?s ability to impose different conditions in respect to a particular development or Council project, having regard to potential site restrictions and best practice. 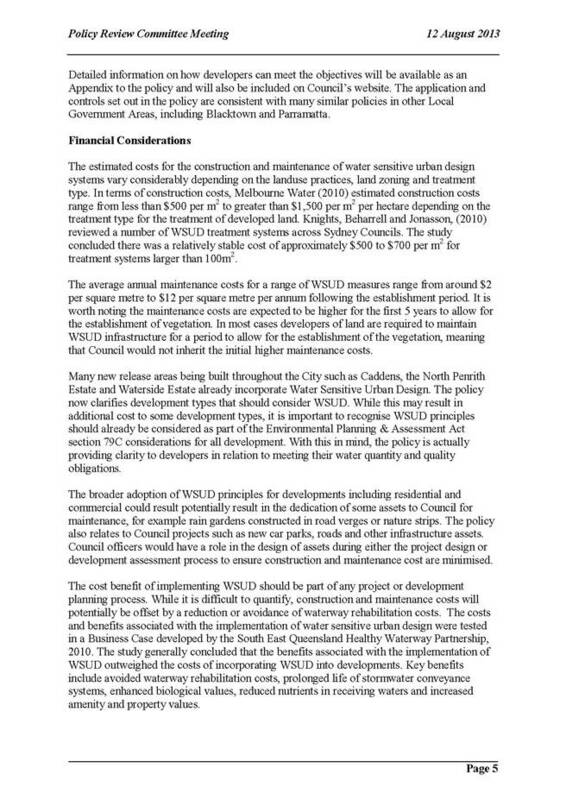 As outlined in the 12 August Policy Review Committee meeting report, the estimated cost for the maintenance of assets related to WSUD can vary. 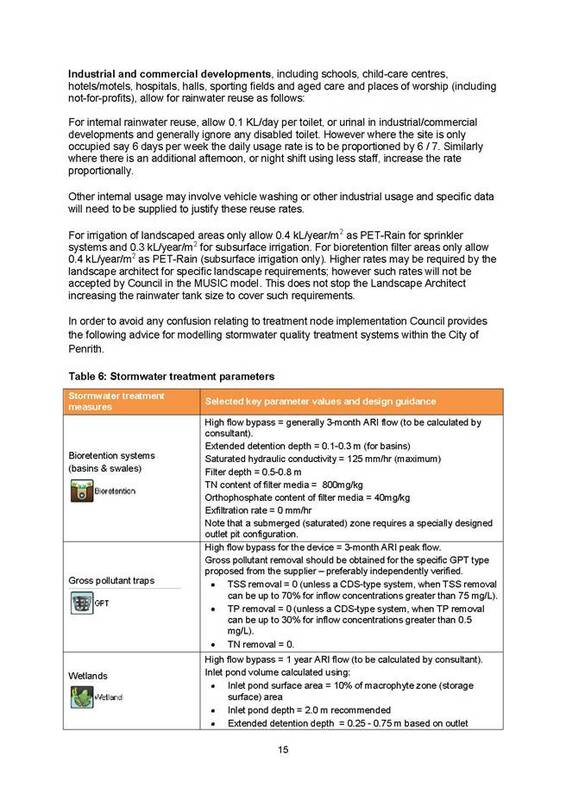 The average annual maintenance costs for a variety of WSUD measures is estimated to range from around $2 per square metre to $12 per square metre per annum following the establishment period. For this reason it is important that a policy is developed to provide guidance on this issue, and that Council Officers are involved in the assessment of these assets during the development process. 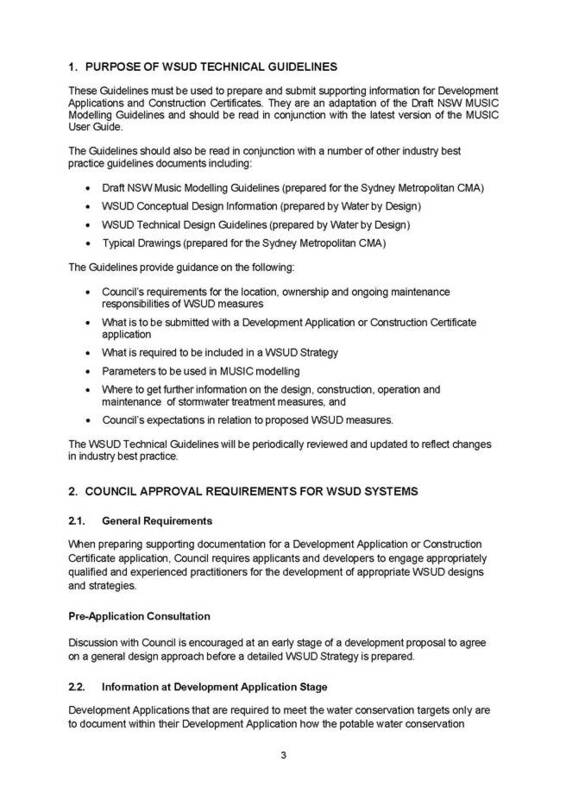 This will ensure that the best outcome is achieved for both the WSUD aspirations of the development, and also Council?s resource allocation in terms of the impact on long-term maintenance obligations. 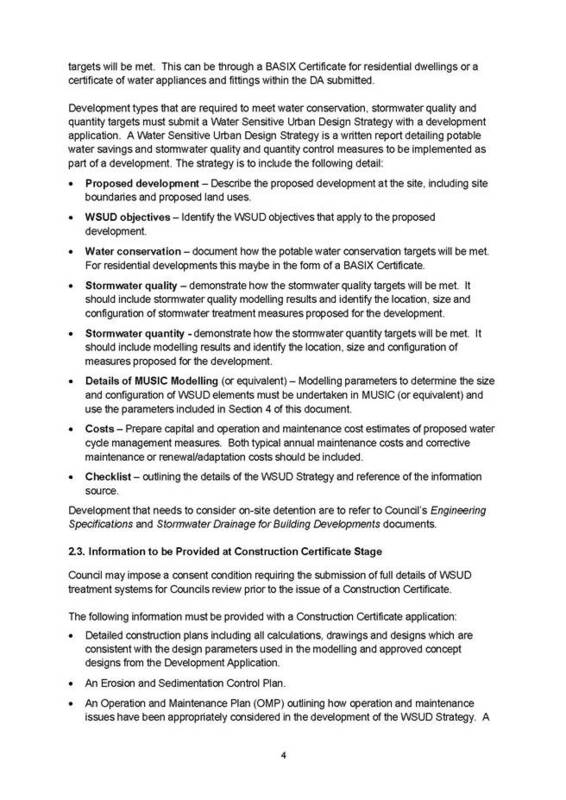 The policy clarifies which developments are required to incorporate stormwater treatment measures and builds on the many education programs and environmental projects that have been completed by Council over recent years. 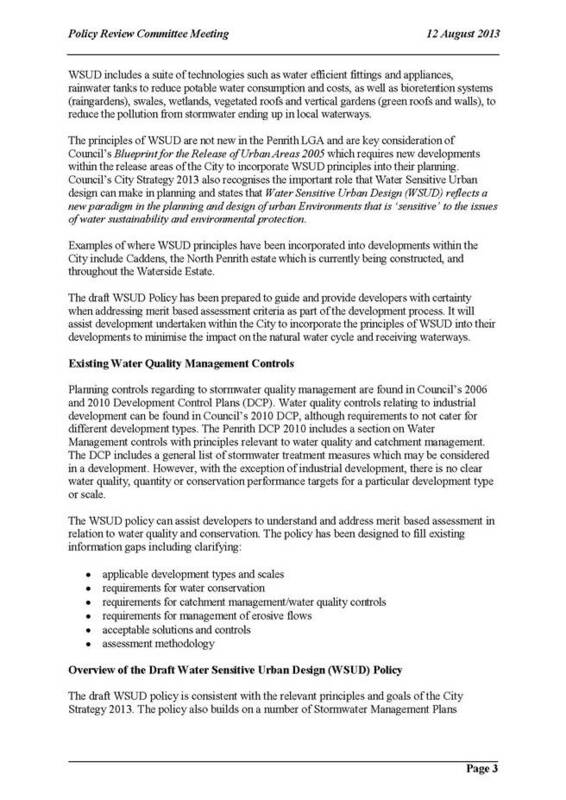 Importantly, the Policy reflects community expectations identified by the City Strategy and demonstrates Council?s leadership in regard to water management. 1.???? 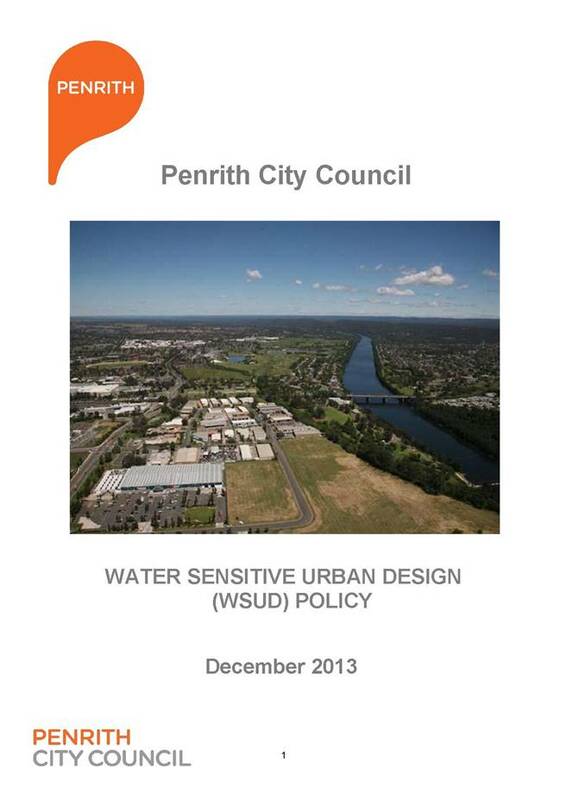 The information contained in the report on Water Sensitive Urban Design (WSUD) Policy be received. 2.???? Council adopt the policy and advise the relevant industry groups of the new requirements with regards to the policy. Local Infrastructure Renewal Scheme - Round 3??? Authorised by:??????????? Barry Husking, Assistant General Manager ?? Council officers have reviewed Council?s existing infrastructure renewal programs, and with consideration to the assessment criteria, identified two applications that have established and sustainable funding sources within the 2013-14 Operational Plan and the Long Term Financial Plan. Any local council in NSW which meets the eligibility requirements and agrees to the conditions of LIRS assistance is eligible to apply. A council may submit an application (and may be eligible to receive a LIRS subsidy) for a maximum of two separate projects/programs. The projects/programs for which a council proposes to incur borrowings to be subsidised under the LIRS should be identified as part of Council?s infrastructure backlog or should enable the provision of new housing. In considering projects for Round 3, borrowings must be for identified infrastructure backlogs and that while the interest rate subsidy is a significant attractor, a funding source for the repayment of the loan principal and the remaining interest not covered by the subsidy, would need to be identified with Council?s existing capacity. Council estimates that the Dunheved Link Road will cost in the order of $8m, based on preliminary concept designs, this figure will need to be refined.? Funds will be generated over time for the construction of the road through the sale of Council and Lend Lease land that is serviced by it.? This funding arrangement will be secured through a Deed of Agreement between the parties and this is currently being finalised. The development and sale of this land will take considerable time and therefore the road?s construction will be delayed. 1.???? The information contained in the report on Local Infrastructure Renewal Scheme - Round 3 be received. 2.???? Applications be made under LIRS Round 3 for the General Revenue component of AREAS ($913,000), and for the CBD Drainage Program (borrowings of $5.7m, total project cost of approximately $7m). Penrith Whitewater Stadium - Annual Report and Board of Directors???? Presenter:??????????????????? Jack Hodge - Stadium Manager - Penrith Whitewater Stadium? - Stadium Manager?s Report?????? Each year, following the Annual General Meeting of the Company, a report is presented to the Council on the year?s activities of the Penrith Whitewater Stadium (PWS), including the financial performance. It gives me much pleasure to present the Chairman?s Report to the Fifteenth Annual General Meeting of Penrith Whitewater Stadium Limited. Patronage for whitewater rafting and canoeing based activities remains healthy. Revenue for the year was $1,655,949 which is 8% less than $1,803,785 for 2012. The financial outcome for the year ended 30 June 2013 resulted in a surplus before depreciation, amortisation and interest of $49,752, a decrease of 52% when compared to the surplus achieved in 2012 of $102,650.? During the year some $79,209 was spent on capital improvements.? Penrith Whitewater Stadium continues to generate a great deal of publicity both nationally and internationally, adding to its reputation as one of the world?s premier sporting facilities. Again the venue has successfully hosted both international and local competitions and has continued to attract a significant number of athletes who see the Stadium as their preferred off-season training venue. I would like to take this opportunity to thank Venue Manager, Jack Hodge and his management team (Simonetta, Jeff, and Vicki) for leading the organization throughout the year.? Penrith Whitewater staff continues to show great dedication and commitment to the business. The underlying enthusiasm and commitment of staff is fundamental to the venue?s continuing success. I would also like to thank my fellow directors for their continuing commitment and input to the operations of Penrith Whitewater Stadium.? This year sees the appointment of Councillor Marcus Cornish and the retirement of George Dodds.? George has been a director for over 6 years and his expertise and experience has been highly valued in the development of the business. Overall participation in the activities offered by PWS declined in 2012-13.? Rafting decreased by 19% and Canoe/Kayak by 39%.? Swiftwater Rescue courses increased by 127%. Whitewater rafting remains the most popular activity and the highest revenue earner for PWS.? Rafting participation decreased from 14,786 to 12,048.? Total revenue for rafting decreased by 16% from $1,210,305 to $1,013,348.? Total PWS income decreased by 8% from $1,803,785 in 2011-12 to $1,655,949.? Total expenses decreased by 4% from $1,829,920 to $1,760,075 resulting in a decrease in operating profit from -$26,134 to -$104,126.? Net loss increased from -$99,721 to -$137,789 due to decreases in rafting and slalom income.? PWS maintained its strong support for the sport of canoeing throughout the year.? The venue hosted the Australian Canoe Slalom Open, Australian Youth Olympic Festival, NSW Slalom Championships and NSW Southern Zone Championships.? PWS facilitated over 323 hours of slalom training and competitions for Australian and International paddlers.? This included 209 hours for the Australian team as part of the Canoe Slalom National Centre of Excellence (NCE) Agreement between PWS, the Australian Institute of Sport (AIS), the New South Wales Institute of Sport (NSWIS) and Australian Canoeing.? The value of PWS?s contribution to the agreement was approximately $84,000. PWS continued its support of various charitable and community organisations.? This included hosting the annual Rotary Club Duck race and the donation of 455 gift certificates to the value of $42,770. Thanks to all PWS staff for their assistance during the year.? Thanks also to the PWS Board of Directors for their ongoing dedication and support. The successful operation of PWS relies upon the support of the general public and a network of companies and organisations.? PWS would like to thank the general public, suppliers, venue stakeholders and neighbouring organisations for their support and looks forward to working together more closely in the future to maximise the ongoing success of PWS and Penrith Lakes. 1.?? To provide continuity the members of the Board shall resign on a rotating basis. At the First Annual General Meeting, three (3) Directors (including one (1) Councillor) shall resign. At the Second Annual General Meeting, three (3) members shall resign (including one (1) Councillor). Thereafter, the members of the Board, except the Council Officer, shall resign after they have served on the Board for three (3) years after appointment or re-appointment to the Board.???????? 2.?? All retiring Directors shall be eligible for re-appointment. Councillor Ross Fowler OAM was re-appointed to the position of Chairman, Helen Brownlee OAM was re-appointed to the position of Deputy Chair and the Council?s Executive Manager City Assets, Mr David Burns was re-appointed to be the Council?s General Manager?s representative and Company Secretary on the Board. 1.???? 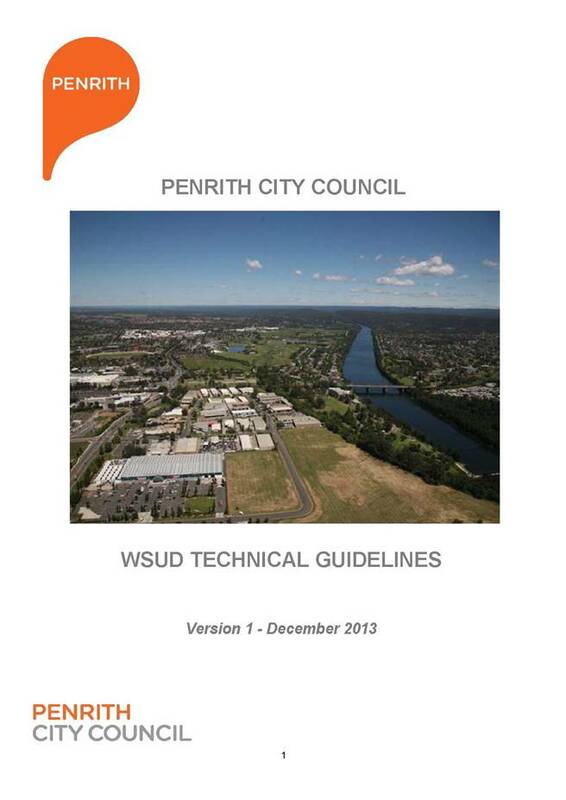 The information contained in the report on Penrith Whitewater Stadium - Annual Report and Board of Directors? be received. 2.???? Council agree to underwrite the operation of the Penrith Whitewater Stadium Limited for 30 months from 1 July 2013. 3.???? 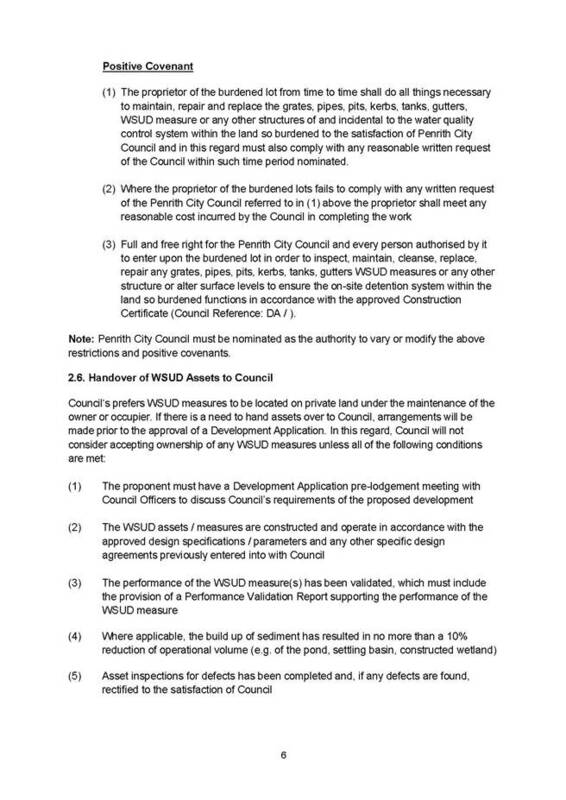 Council note and support the appointment and re-appointment of the persons named in the report to the Board of Directors of Penrith Whitewater Stadium Ltd.?? Penrith Performing and Visual Arts Ltd - Annual Report??? ????????????????????????????????????? Mr Peter Anderson - Chairman - Penrith Performing & Visual Arts Ltd - Annual Report ??????? This report details the performance of the Penrith Performing and Visual Arts Ltd (PP&VA) for the financial year 1 July 2012 ? 30 June 2013. Penrith Performing & Visual Arts (PP&VA) established in 2007, brought together Penrith?s leading cultural organisations, individually operating since the sixties, eighties and nineties. Operating on two sites, spanning the Nepean River, PP&VA brings together the production and presentation of performing and visual arts all underscored by education and access programs, including the Penrith Conservatorium of Music. 2012/13 was a year of challenge and change. In September 2012, a new Gallery Director Dr Lee-Anne Hall was appointed and commenced work. Shortly thereafter PP&VA?s inaugural CEO, Mr John Kirkman resigned to take up his new position at the Information and Cultural Exchange in Parramatta. In the face of an imminent funding application deadline for Arts NSW, the company undertook a strategic planning process led by consultant Jennifer Lindsay. Whilst Arts NSW announced a review of Funding Programs and Policy, and an extension of funding for PP&VA, the planning process itself, being undertaken at a time of change in leadership, and after a long period of stability within a changing operating context, was very opportune. The Board considered the Strategic Plan at its August 2013 meeting, endorsing it to guide the company?s operation for 2013/14.
? Q Theatre production of Lachlan Philpott?s critically acclaimed Truck Stop was nominated for four Sydney Theatre awards ? and won two. The production was also listed in the Sydney Morning Herald?s top 10 for 2012 and was named second best of 2012 in the SYP Review Blog. Following this success, Truck Stop won an AWGIE as the Best New Work for Young Audiences in 2013.
? Delivery of fifteen new exhibitions at the Penrith Regional Gallery & The Lewers Bequest.
? The trial of a new approach to visual arts education through the establishment of the Lewers Learning Centre ? an immersive, interactive exhibition at Lewers House with a focus on families, early childhood and primary.
? Presentation of 56 seasons and a total of 102 PP&VA presented performances attracting 23,186 attendances and $623,352 in gross box office.
? Delivery of 441 performing arts workshop classes with 10,471 attendances attracting $145,721 in fees. 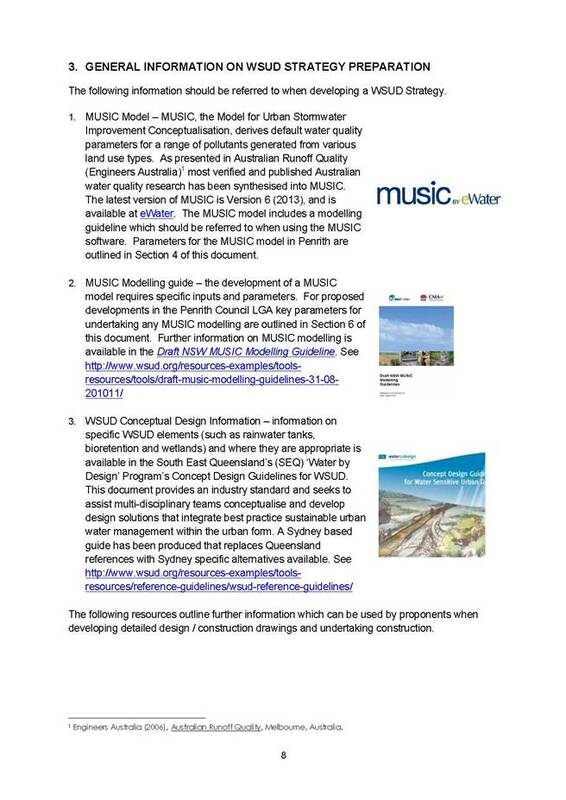 An additional 15,960 music tutorials were delivered through the Penrith Conservatorium of Music.
? Ongoing partnership in the delivery of the Mondo Project involving the activation of the Civic Space on Thursday evenings.
? Ongoing Lachlan Shire Council cultural partnership and programs- On the Road, also supported by the Vincent Fairfax Family Foundation.
? Continuing partnerships with a range of premier Australian arts organisations/institutions e.g. ABC Classic FM and the Museum of Contemporary Art (Sydney).
? Delivery of Dance Hall Days, an original devised work with six performances across three venues from St Marys and Springwood to Condobolin. 1.??? Maintenance Works and Capital Replacement. The need to maintain and replace essential capital items across PP&VA continued to impact heavily on the annual budget ? in particular the older parts of the building are beginning to show their age ? and the need for a future-focussed capital vision was raised at our strategic planning meeting. Increasing public amenity and the flow of incidental traffic through a hospitality offering at The Joan continues to be a consideration for management. 2.??? Access issues - ensuring access by families with prams and strollers as well as patrons in wheelchairs, and frames continues to be a concern across both sites where a lack of automatic doors is a daily challenge to entry. 3.??? Instruments and artistic assets ? of particular concern is the age of the grand pianos which are nearing the end of their practical life. 4.??? Utilities Costs. Costs for utilities ? electricity, water rates and telephone charges continue to increase ? rising almost 28% in this period over the previous financial year. However market forces determine that a consequential increase in hire rates would not be accepted by community hirers putting increased pressure on operational margins for PP&VA. Nonetheless some consideration of increases will occur for 2014. 4. ? Operational, HR and business systems ? old and outdated ticketing and event systems are restricting capacity to perform business functions. A lack of a collection management system is a significant obstacle to digital access, academic research and appropriate collection development. The company structure is largely historical and due for a comprehensive review in order to ensure a level of equity and appropriate professionalism into the future. 5. ? Funding. The funding environment for NSW is increasingly competitive with the NSW Government introducing restrictions on additional (project) grant availability to existing clients. This is unlikely to change into the near future and the Reviews currently underway are yet to determine future priorities. Total revenue was up by 9.55%, from $3,252,581 to $3,563,136. However the total expenditure for the period was up by a corresponding 10.19%, increasing from $3,268,335 to $3,601,346. All main areas of revenue were up on the previous year with the exception of interest which fell slightly to $36,681 and ?other? which fell by $7,418. PP&VA has a primary brief and responsibility to the development and delivery of innovative artistic productions. This year an examination of processes around artistic decision-making and investments was commenced, with a greater focus on a business case rationale factoring in artistic and community drivers as well as estimated box office returns.? Penrith Performing and Visual Arts Limited (PP&VA) reported a net deficit of $26,370 for the 2012-13 financial year, after accounting for Council?s subsidy of $1,506,518. This is an increase of $10,616 or 67.4% on their 2011-12 result, a $15,754 deficit after accounting for Council?s subsidy of $1,461,518. Revenue from PP&VA?s own funding sources increased in 2012-13 to $1,551,247 from $1,287,908 in 2011-12. This increase in revenue of $263,339 or 20.4% is mainly due to an increase in Ticket sales (31.7%), Venue Hiring Fees (29.1%), Bar Sales (32.7%) and Booking Fees (21.0%).? 1.?????? To provide continuity the members of the Board of Directors, except for the General Manager or his/her nominee, shall retire on a rotating basis. At the first Annual General Meeting after 1 July 2006, five (5) Directors shall retire (including one (1) Councillor). At the second Annual General Meeting after 1 July 2006 five (5) directors shall retire (including one (1) Councillor). At the third General Meeting after 1 July 2006 five (5) directors shall retire. Thereafter, the members of the Board of Directors shall retire after they have served on the Board of Directors for three (3) years after appointment or re-appointment to the Board of Directors. 2.???????? All retiring Directors shall be eligible for re-appointment. The Board reaffirmed the resolution to maintain ten Directors on the Board as an appropriate size.? Council?s Executive Manager ? City Planning & Community, Ruth Goldsmith is the General Manager?s representative and was re-elected Company Secretary. 1.???? The information contained in the report on Penrith Performing and Visual Arts Ltd - Annual Report be received. 2.???? Council agree to underwrite the operation of the Penrith Performing and Visual Arts Ltd for a further period of 30 months from 1 July 2013.